For a listing of thousands of Italian Art and Architecture images archived at the Australian National University, go to http://rubens.anu.edu.au/lists/italy.html, and follow the links. Click on links or small images below to go to large images for Unit 6. 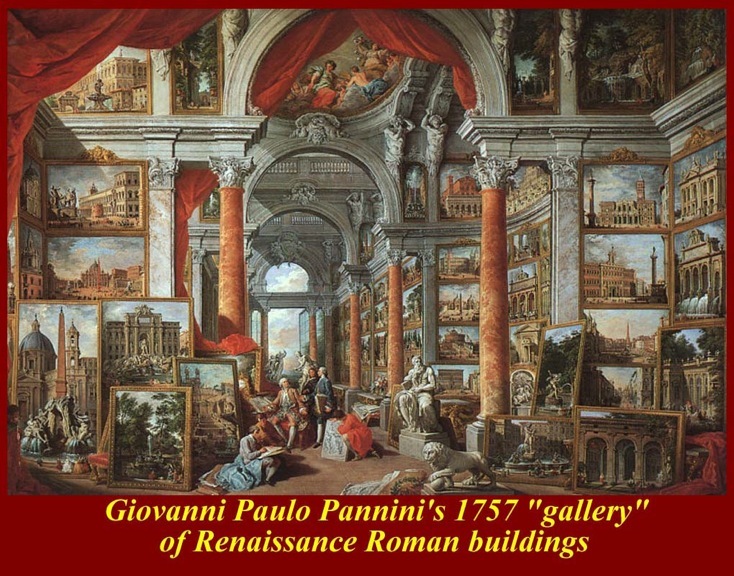 Giovanni Paolo Pannini or Panini (June 17, 1691 – Rome, October 21, 1765) was an Italian painter and architect, mainly known as one of the vedutisti or "view painters". As a painter, Pannini is best known for his vistas of Rome, in which he took a particular interest in the city's antiquities. 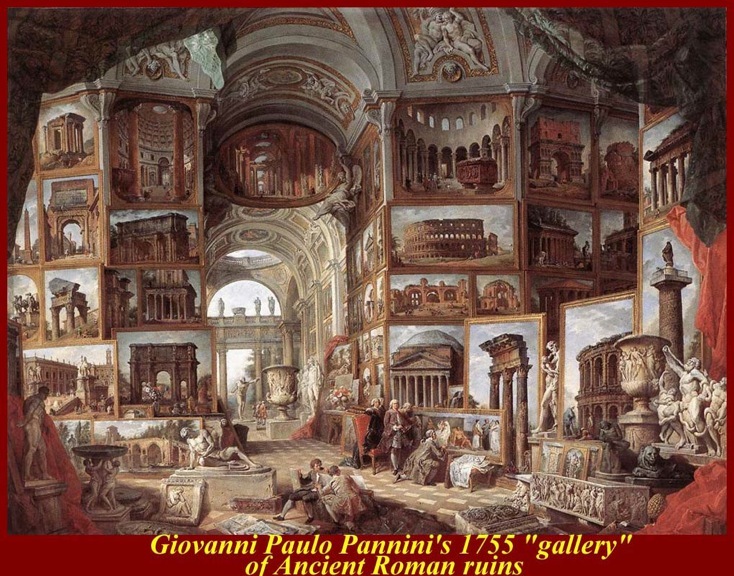 Among his most famous works are the interior of the Pantheon, and his vedute — paintings of picture galleries containing views of Ancient Rome (1757) and Renaissance Rome (1759). Most of his works, specially those of ruins have a substantial fanciful and unreal embellishment characteristic of capriccio themes. 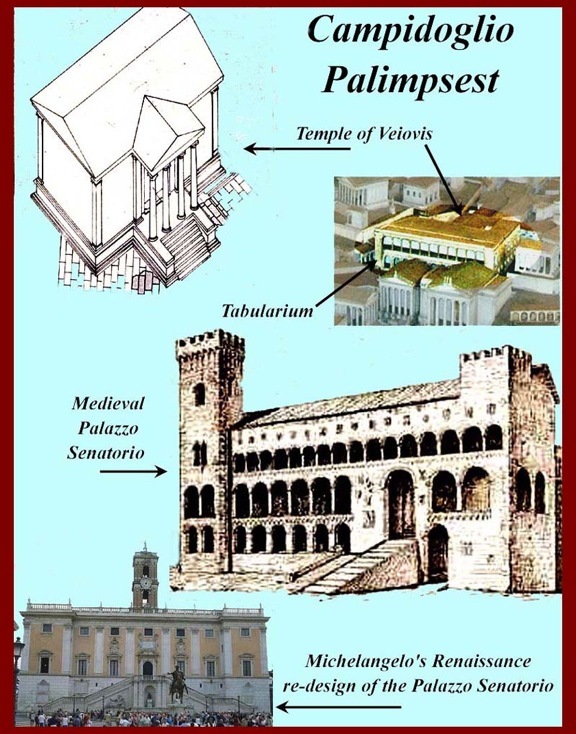 The qualitative and size differences between medieval and renaissance Roman structures is clear, and the driving force behind the change is, obviously, the wealth of the patrons. 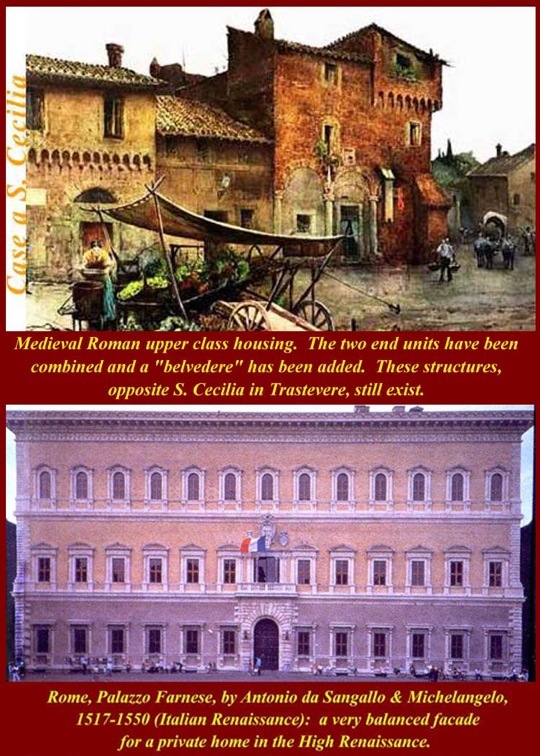 Both the medieval and the renaissance structures in the two images are still in use; the medieval Trastevere houses opposite Santa Cecila have been converted into very expensive condos. 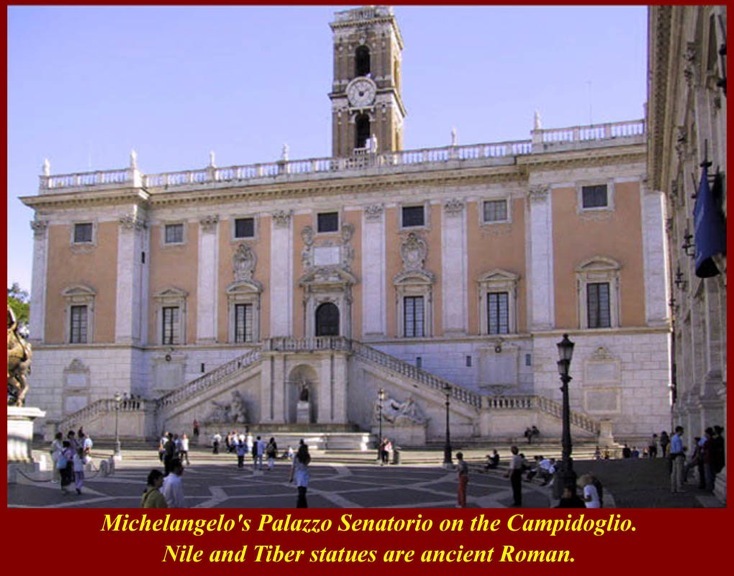 Rome's Campidoglio (the Capitoline Hill) is a veritable palimpsest of structures. A pre-Roman temple to Veiovis, built is the saddle between the two Capitoline peaks, is still in the lowest level below the Roman Republican Tabularium (archive). Built above the tabularium was built a fortified medieval residence, that, in Renaissance times, was restyled by Michelangelo into the Palazzo Senatorio. That iteration still stands and is used for modern Roman municipal functions. The Ancient Roman Temple of the Capitoline Triad (Jupiter, Juno, and Minerva), also known as the Temple of Jupiter Optimus Maximus stood on one of the two peaks and is now partially covered by the Renaissance Palazzo dei Conservatori (1563) redesigned by Michelangelo, part of the current Campidoglio Museums. The ancient Arx, the outdoor temple where ancient Roman auguries were taken, was first covered by the temple of Juno Moneta and later by the church of S. Maria in Aracoeli. Beside that church, covering part of the saddle, is Michelangelo's Palazzo Nuovo also designed by Michelangelo and also part of the Capitoline Museums. 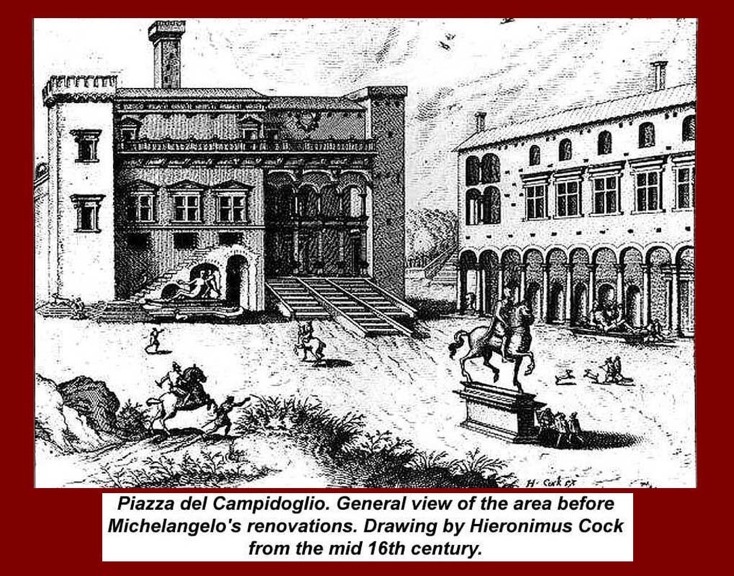 Michelangelo also designed the grand staircase (Cordonata Capitolina) facing the Campus Martius. Definition: a cordonata (Italian noun, from cordone, meaning "lineal architectonic element which emphasizes a limit") is a sloping road composed of transversal stripes ("cordoni"), which are made with stone or bricks. It has a form almost similar to a flight of steps, but allows the transit of horses and donkeys. 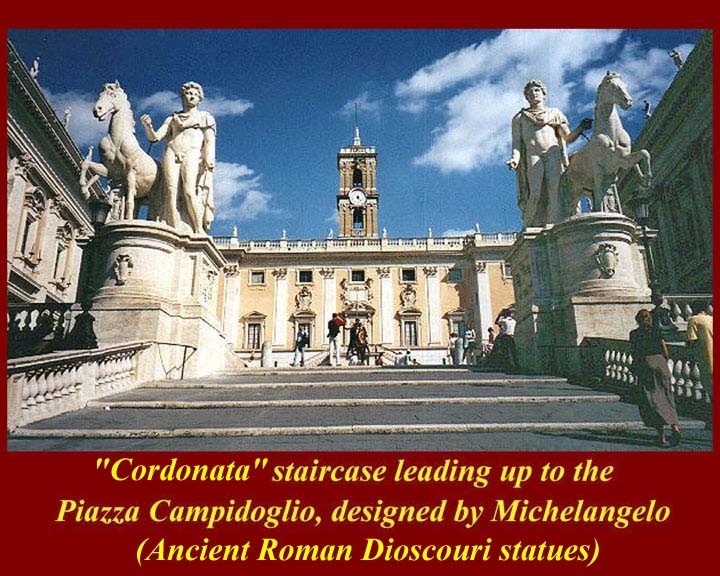 Famous Italian cordonate are in Rome leading to the Piazza del Campidoglio (the cordonata capitolina, work of Michelangelo) and, also in Rome, a cordonata leading to the Piazza del Quirinale, and gives the name to the Via della Cordonata). The Palazzo Spada houses a grand art collection, the Galleria Spada. 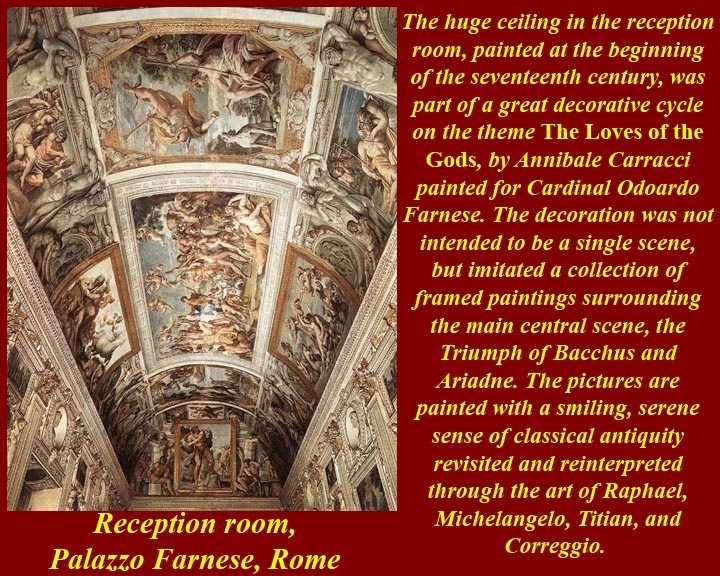 The collection was originally assembled by Cardinal Bernardino Spada in the 17th century and added to by his grandnephew Cardinal Fabrizio Spada (1643-1717), and by Virginio Spada (1596-1662). The palace is located in the rione Regola, at Piazza Capo di Ferro, 13, with a garden facing the Tiber, very close to the Palazzo Farnese. It was originally built in 1540 for Cardinal Girolamo Capodiferro. Bartolomeo Baronino, of Casale Monferrato, was the architect, while Giulio Mazzoni and a team provided lavish stucco work inside and out. 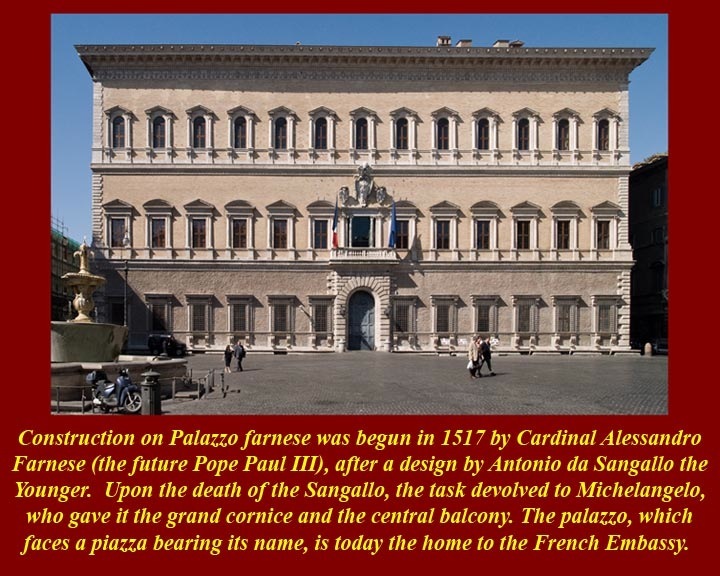 The palazzo was purchased by Cardinal Spada in 1632. He commissioned Francesco Borromini to modify it for him, and it was Borromini who created the masterpiece of trompe-l'oeil false perspective in the arcaded courtyard, in which diminishing rows of columns and a rising floor create the optical illusion of a gallery 37 meters long (it is 8 meters) with a life size sculpture in daylight beyond: the sculpture is 60 cm high. 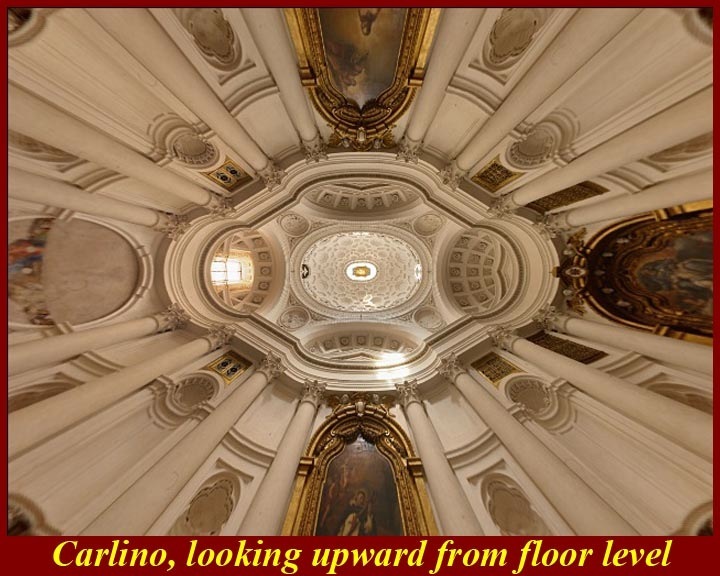 Borromini was aided in his perspective trick by a mathematician. The Mannerist stucco sculptural decor of the palazzo's front and its courtyard facades feature sculptures crowded into niches and fruit and flower swags, grotesches and vignettes of symbolic devices (impresi) in bas-relief among the small framed windows of a mezzanine, the richest cinquecento facades in Rome. 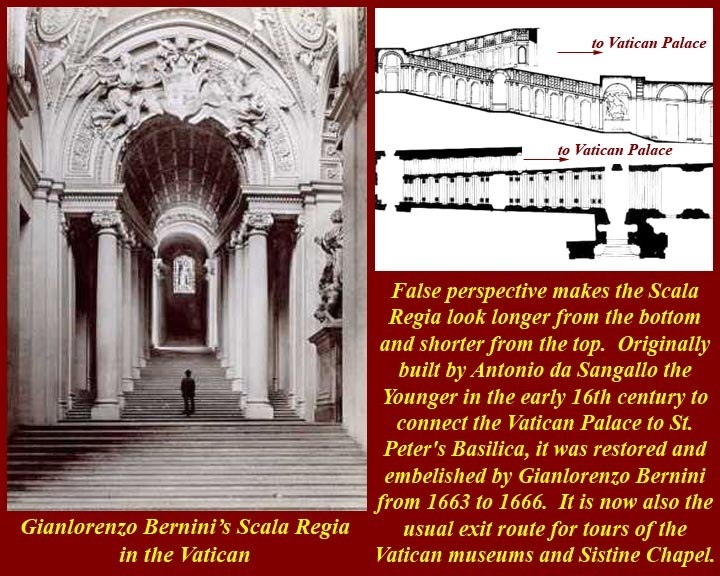 The third image shows Rome's other famous trompe-l'oeil false perspective the Vatican scala Regia by Borromini's rival Gian Lorenzo Bernini (1663-66). 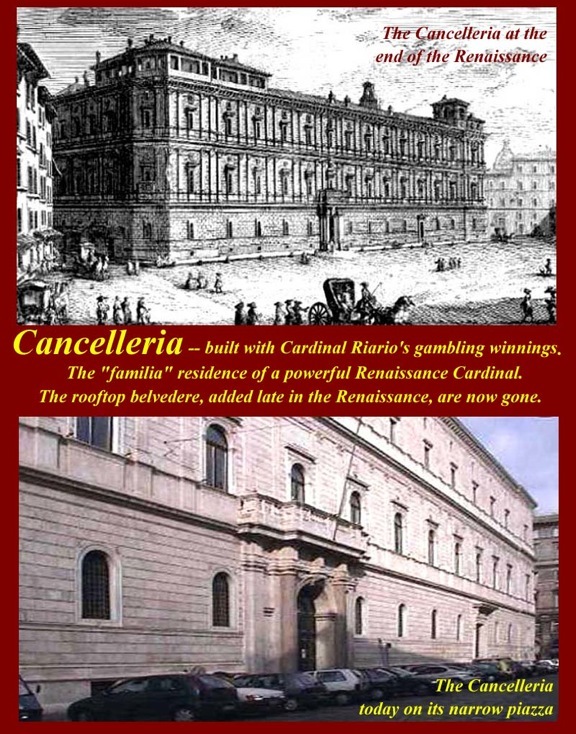 The papal Cancelleria was constructed between 1489–1513 and was the first palazzo in Rome to be built from the ground up in the new Renaissance style supposedly paid for with the winnings of one night's gambling by Cardinal Raffaele Riario, who held the post of Cardinal Camierlengo to his powerful uncle, Pope Sixtus IV. The long facade with its rhythm of flat doubled pilasters between the arch-headed windows is Florentine in conception, comparable to Leone Battista Alberti's Palazzo Rucellai, although the concept of drafted masonry is ancient Roman in its origin. 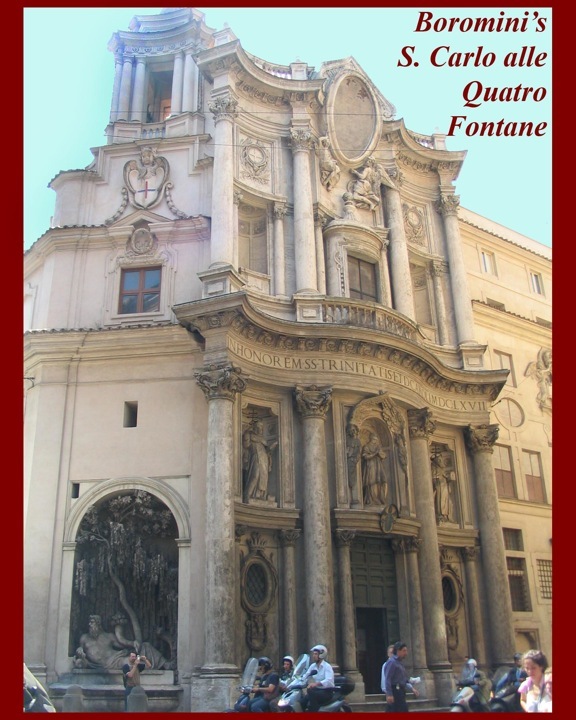 The grand doorway was added in the 16th century by Domenico Fontana on the orders of Cardinal Alessandro Farnese. The building's exterior bone-colored travertine was scavenged from the nearby Roman ruins of the Theatre of Pompey. The forty-four Egyptian granite columns of the inner courtyard are from the porticoes of the theatre's upper covered seating, however they were originally taken from the theatre to build the old Basilica of S. Lorenzo in Damaso. (A newer S. Lorenzo is incorporated in the Palazzo.) In the central rectangular courtyard, the two lower floors are two open ambulatories. While opinion of the identity of the palazzo's architect is divided, Francesco di Giorgio Martini and Baccio Pontelli may have been involved in the early stages of design. The traditional attribution to Bramante and Andrea Bregno have been largely discredited, though many guidebooks still attribute it to Bramante. The Palazzo di Venezia (formerly Palace of St. Mark) is just north of the Capitoline Hill at the southern side of the Campo Marzio. The palazzo faces Piazza Venezia and Via del Plebiscito. It currently houses the National Museum of the Palazzo Venezia. The original structure of this great architectural complex consisted of a modest medieval house intended as the residence of the cardinals appointed to the Roman church of San Marco. In 1469 it became a residential papal palace, having undergone a massive extension, and in 1564, Pope Pius IV, to win the sympathies of the Republic of Venice, gave the mansion to the Venetian ambassadors on condition that a part of the building should be kept as a residence for the cardinals--the Apartment Cibo--and that the Venetian Republic should provide for the building's maintenance and future restoration. The Palazzo thus was the Embassy of Venice in Rome. It took on a new layout when, in 1451, Pietro Barbo, son of one of the sisters of Pope Eugenius IV, became cardinal. 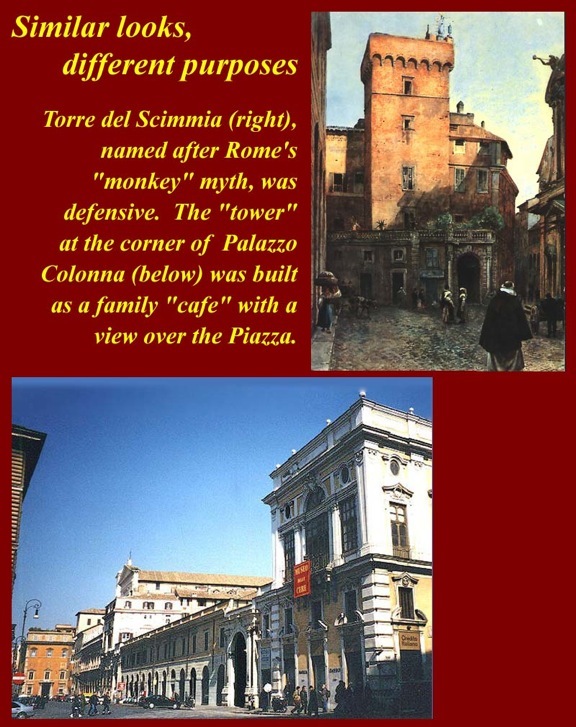 It was a fortified building, composed of a half-basement and a mezzanine that functioned as a piano nobile, extending over a small area between the basilica and the gate of the present palazzo overlooking the piazza, with a small external tower. It was a building of no exceptional size but was sufficiently dignified as a cardinal's residence so that, even in 1455, Pietro Barbo could proudly boast of it, having a commemorative medal struck in its honor. In 1455, the building manifested some of the first Renaissance architectural features in Rome; although the overall aspect is of a massive, defensible medieval structure with battlemented crown. It was built around the medieval tower at the right of its facade and incorporated within its mass the ancient Church of San Marco founded by Pope Marcus in 336 and dedicated to the Evangelist who would become protector of Venice. The complex was completely rebuilt in in 833 and often modified since. Much of the stone to build the palazzo was quarried from the nearby Colosseum, a common practice in Rome until the 19th century. The design is traditionally attributed to Leone Battista Alberti, the Venetian cardinal, Pietro Barbo, who later became Pope Paul II was the patron: he continued to inhabit it even as pope. 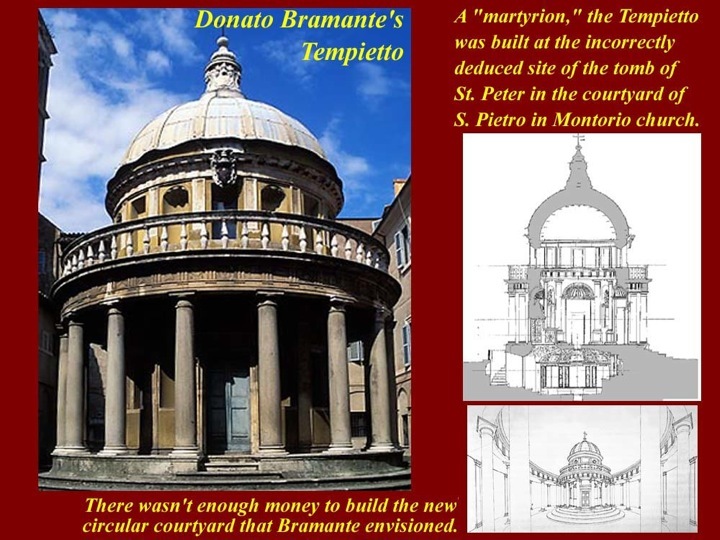 Donato Bramante's Tempieto in the cloister of San Pietro in Montorio, modeled after ancient Roman circular temples, was built by Bramante after 1502, on the commission of the Ferdinand of Aragon and Isabella of Castile. The emphasis here is on the harmony of proportions, the simplicity of volumes (cylinder, hemisphere) and the sobriety of the Doric Order. 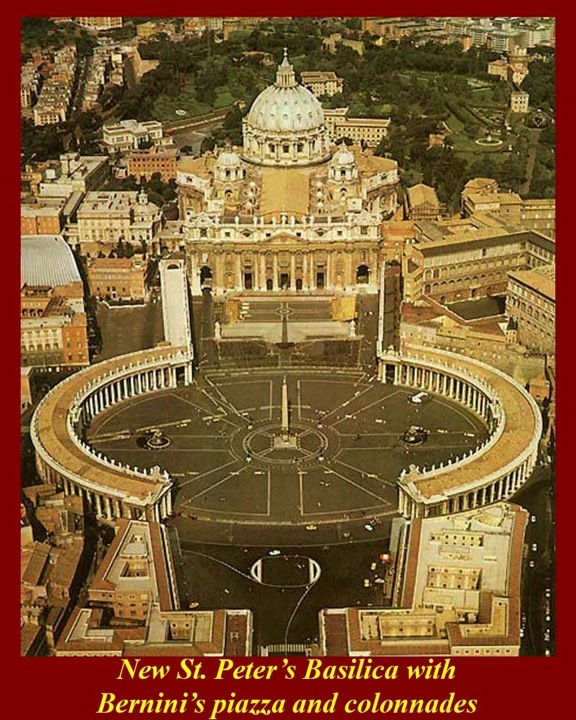 The circular plan symbolizes divine perfection. 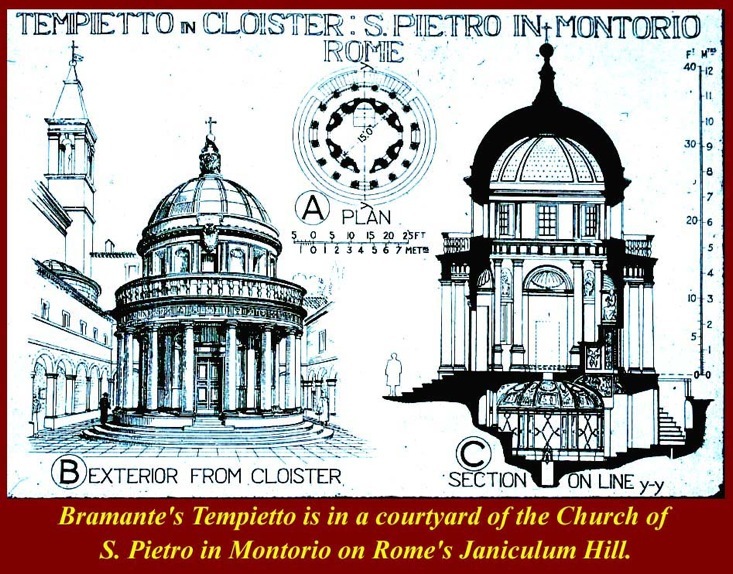 Inspired by ancient temples, the Tempietto is both a homage to antiquity and a Christian memorial. Its location was on the incorrectly identified site of the martyrdom of the apostle Peter. 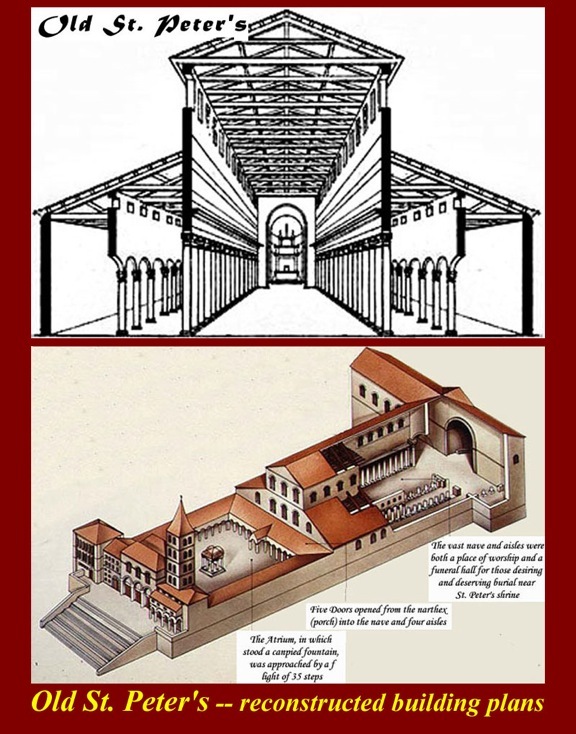 The original plan to make the cloister round and to install an outer ring of columns. 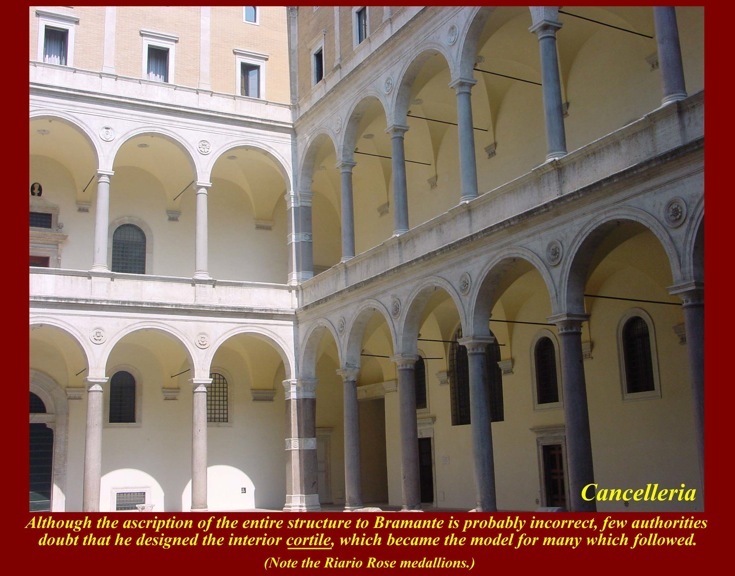 A bio of Bramante is at http://en.wikipedia.org/wiki/Donato_Bramante. Santa Maria della Pace was known as Sant'Andrea de Aquarizariis until it was rebuilt and a new facade was added in 1482 by Pietro da Cortona on a commission from Alexander VII. 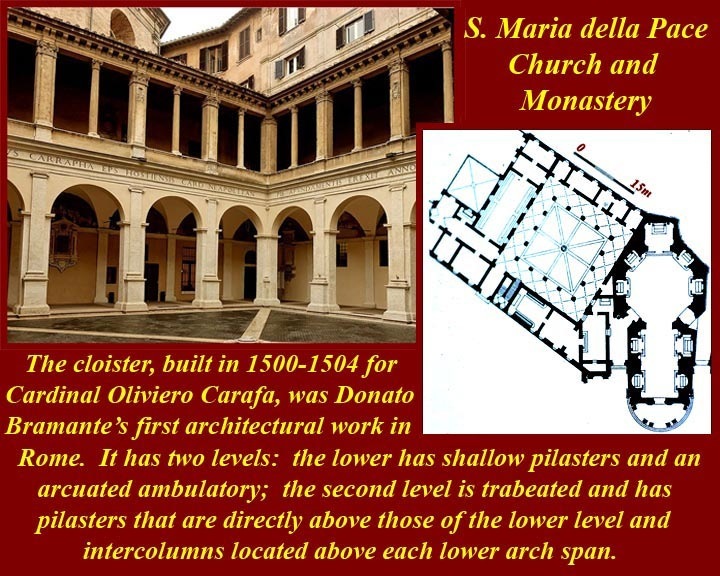 The cloister, built from 1500-1504 for Cardinal Oliviero Carafa, was Bramante's first independent architectural work in Rome. A biography of Pietro da Cortona is at http://en.wikipedia.org/wiki/Pietro_da_Cortona. St. Peter's church, the greatest architectural project of the Roman renaissance, lies at the southeast corner of the Vatican. 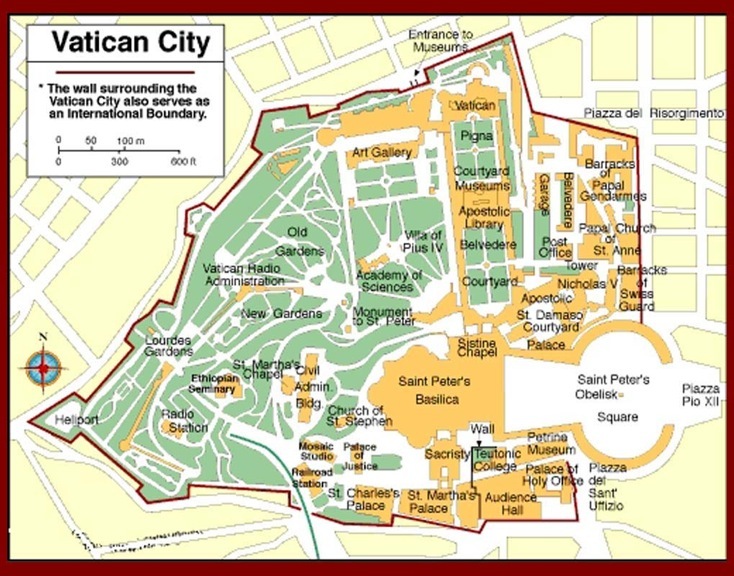 A map of the Vatican necropolis (cemetery) is at https://en.wikipedia.org/wiki/Vatican_Necropolis#/media/File:Plan_of_the_Necropolis.jpg . 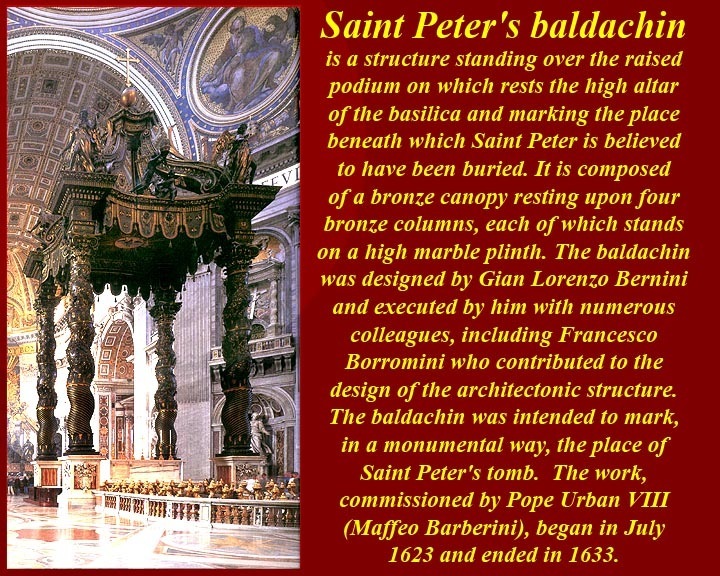 For much more on the St. Peter's Basilica, see http://www.vaticanstate.va/content/vaticanstate/en/monumenti/basilica-di-s-pietro.html. 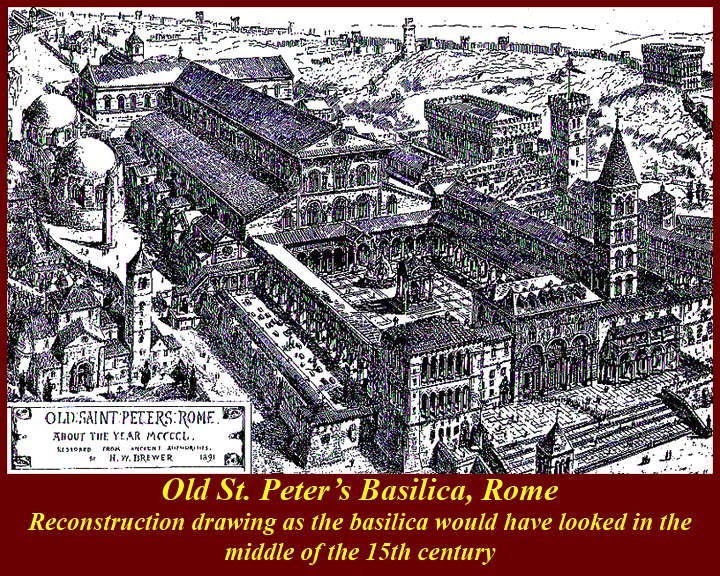 By the time of the Renaissance, Old St. Peter's was crumbling and ready to collapse. 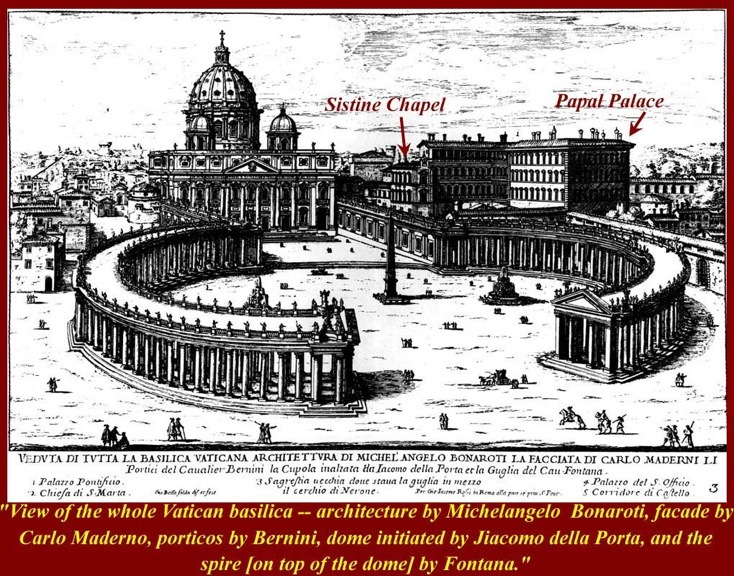 As can be seen from the images, the old basilica was shaped like a T and it had a large courtyard (of the catechumens) in which candidate members of the church could attend service and ceremonies. The second image is by Marten Jacobszoon Heemskerk van Veen whose bio is at http://en.wikipedia.org/wiki/Marten_Jacobszoon_Heemskerk_van_Veen. 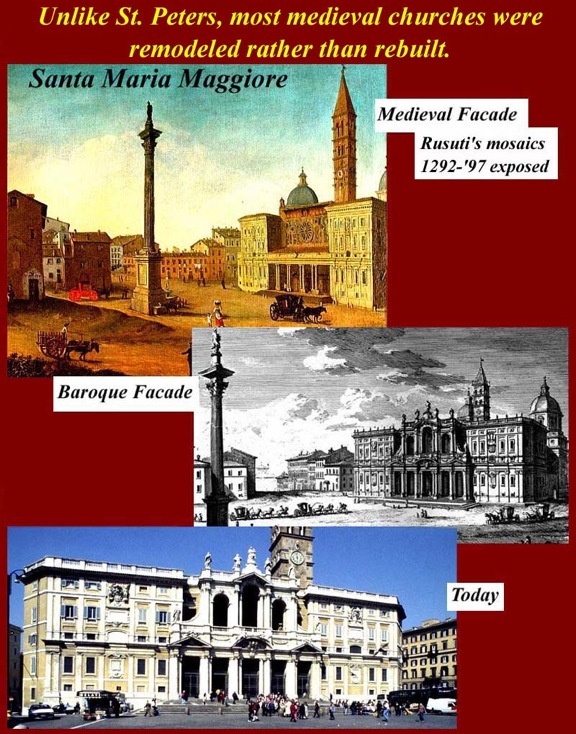 The first image is a Giovanni Battista Falda print from an etching made around 1669, about 40 years after the completion of the new basilica. It was one of a series of caption labeled etchings of Roman churches. The second image is, of course, a modern overhead view. When Carlo Maderno started to build the facade, he was bound to the already existing Michelangelo wings flanking the central classical element. He just put the attic all around the building, as planned by Michelangelo. That creation looks mighty and dynamic along the west side of the Basilica but is disharmonious in the facade. For this reason, at the far sides of the facade, Maderno planned two bell towers, but 1621, at the death of Paul V, the ground subsided and the building of the two bell towers had to be stopped. 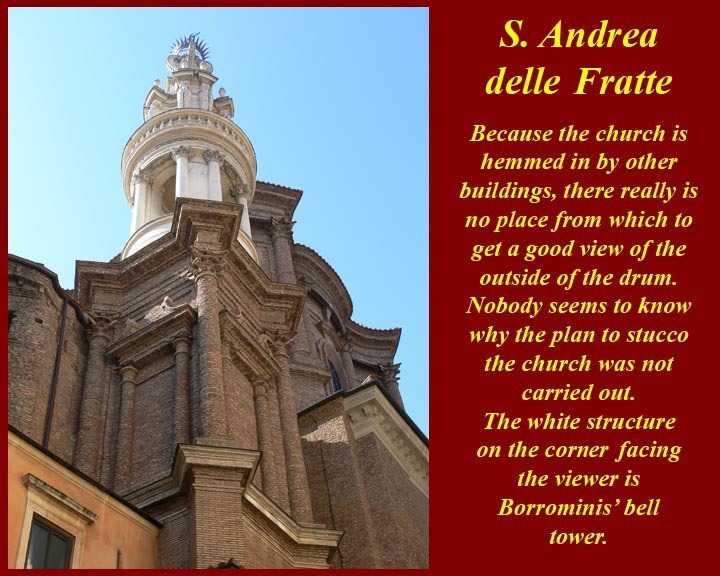 Working to Maderno's plan, Bernini tried to erect the bell towers again in 1646 but had to demolish the left-hand side bell tower because of cracks in the facade. Only the bases of the bell towers remain, two archways at the sides of the facade that seem to form part of it while they should have been separated. This was remedied in 1790 by the installation of two clocks designed by Giuseppe Valadier. The eight gigantic columns of the facade are almost 10ft wide and 90 feet high. 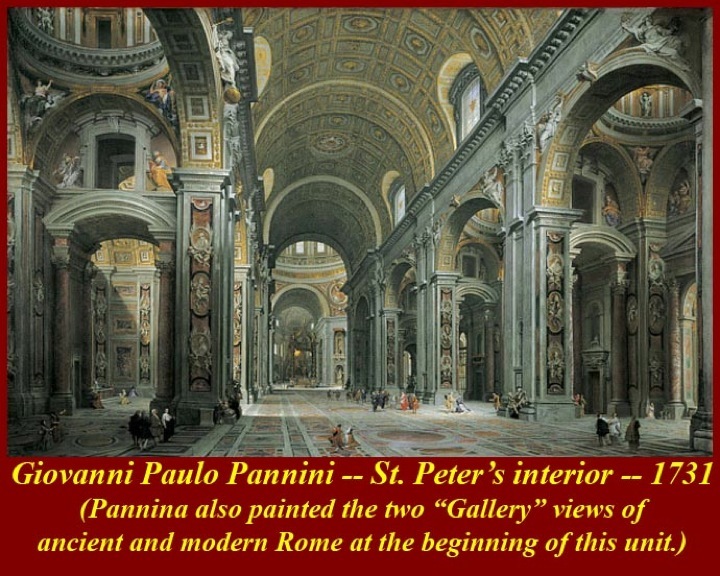 The first image shows the view from St. Peter's Square; although the facade is very wide and defies the canons of classical architecture, it is still high enough to block the view of the Michelangelo's dome. Michelangelo became chief architect of the Basilica in 1546. At the time of his death (1564), the dome was finished as far as the drum, the base on which dome sits. It was vaulted between 1585 and 1590 by the architect Giacomo della Porta with the assistance of Domenico Fontana, who was probably the best engineer of the day. Fontana built the lantern the following year, and the ball was placed in 1593. Only from further back is the majestic dome visible. The third view is from the upper level of Castel Sant'Angelo, which is high enough to give a full view of the facade and the dome over the intervening buildings. 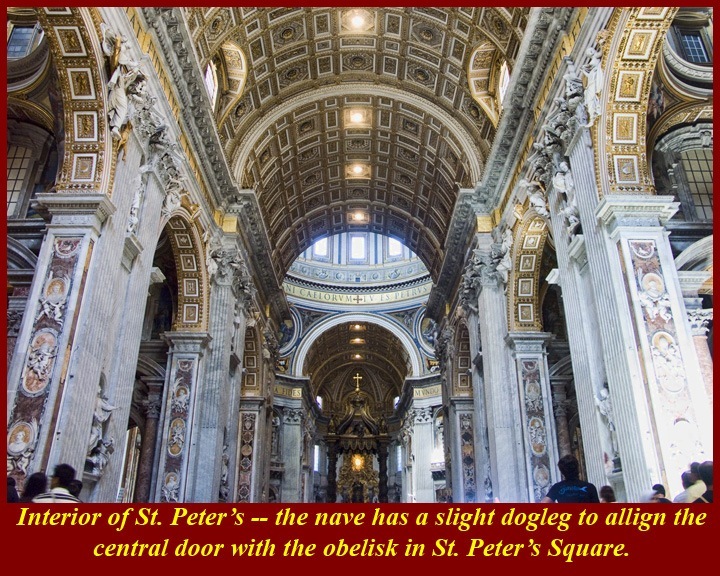 The interior space of St. Peters is larger than that of any other Christian church. 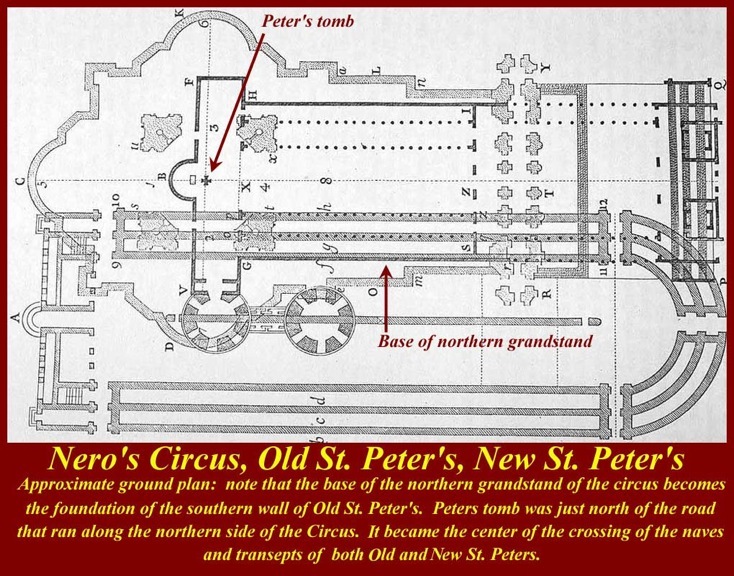 A detailed interactive floor plan is available at http://stpetersbasilica.info/floorplan.htm. 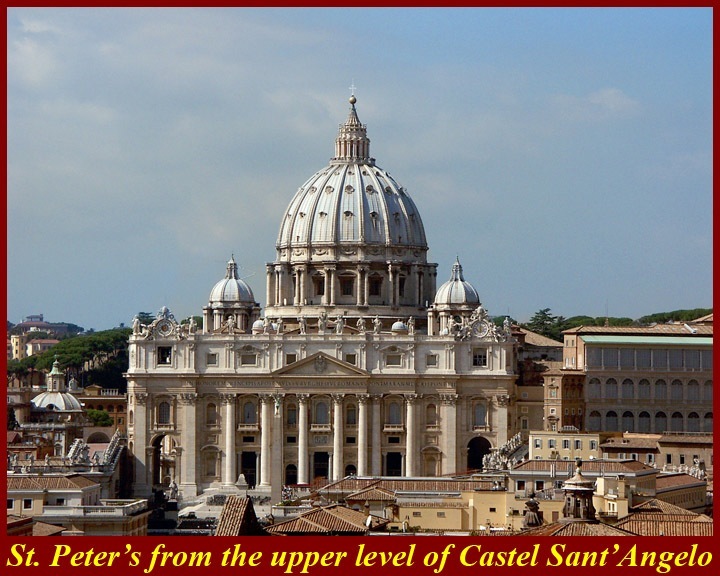 http://stpetersbasilica.info/ is undoubtedly the best Internet site for what is inside the Basilica with links to explanations and large scale images, some of which give much better views than those that can be had on an actual visit to the Basilica. If you are planning to visit the Basilica, you should visit this Internet site first. "Rome is said to have more than 500 churches and all but one are Catholic churches." That is no longer precisely true, since the city boundaries now officially take in all the suburbs and a lot of the surrounding countryside. The "only", at least the first, Protestant Church in Rome, St. Paul's Within the Walls, an American Episcopal Church of the Anglican Communion is beyond the purview of this course since it was built in 1873. 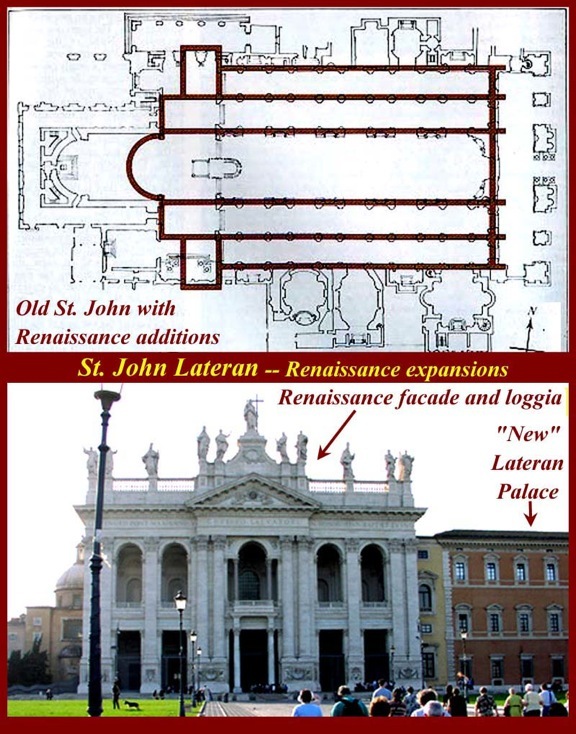 Many of Rome's churches have long histories, and the original structures of some of the larger and more important churches have long since seen multiple remodelings into "new" churches -- and by new, we most often mean Renaissance churches, often with even newer Baroque facades. As mentioned earlier, this course will treat the Baroque architectural period as an extension of the Renaissance. The Gesu, the headquarters church of the Jesuits, sits on Piazza della Gesu in Rome. 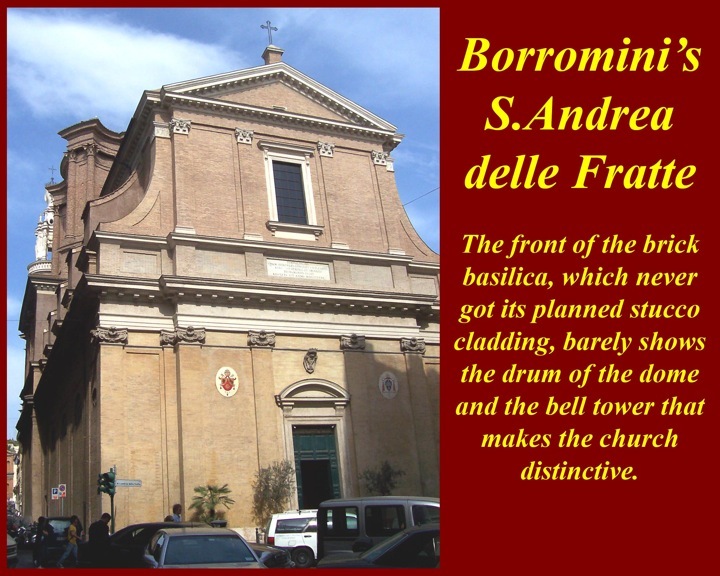 Before the Church was built, the area was famous for its brothels but Ignatius Loyola, the founder of the Jesuits, insisted that the small local church of Sant'Andrea was a suitable church for the home of his newly accredited order. Later cynics and enemies of the Jesuits were later to point out that the site is on the route of Papal processions through the city, and all the Popes since Paul III (Alessandro Farnese, Pope from 1534 to 1549), who authorized the structure, has had ample time to contemplate the Gesu and the Jesuits on their long progresses down the avenue that is now called Corso Vittorio Emanuele III. There's an old Roman fable about the force and constancy of the wind in front of the Gesu Church. It goes like this. 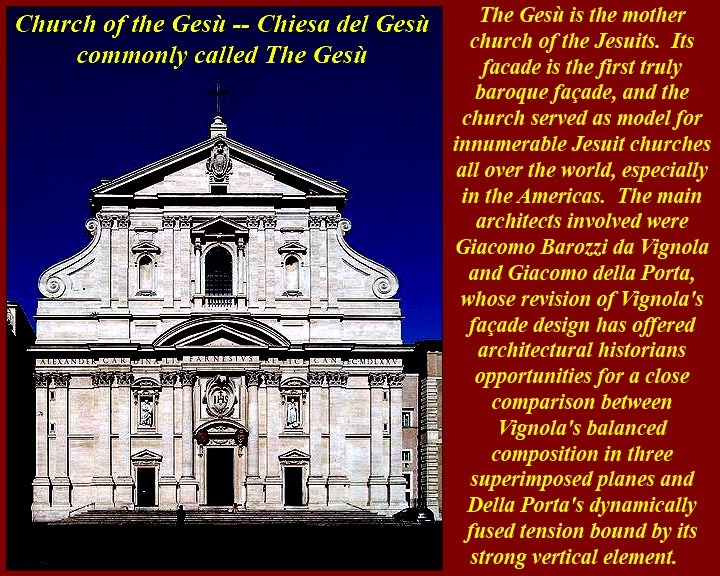 The facade of the Gesu is the first truly Baroque facade anywhere, and it served as a model for numerous churches around the world, especially for Jesuit churches in the Americas. Its architects were, first, Giacomo Barozzi da Vignola and then Giacomo della Porta who added the strong vertical elements. 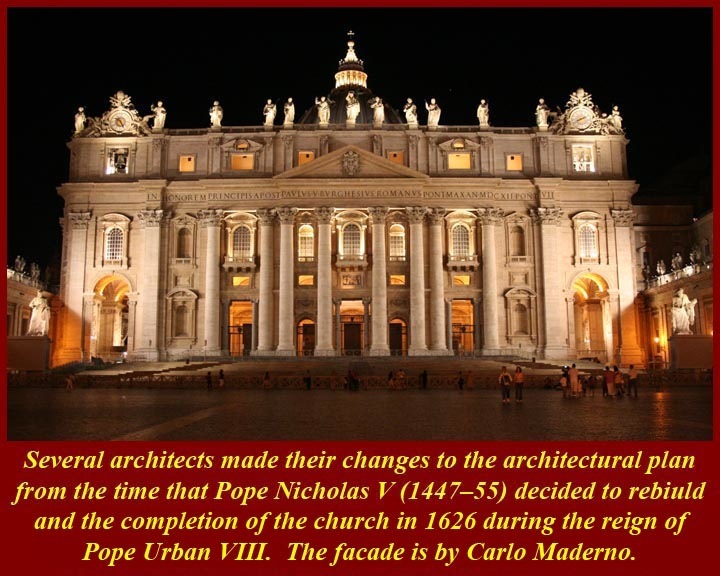 The Baroque period made marked changes in Renaissance architecture and some architectural historians say it should not be considered part of the Roman renaissance (but those guys are mostly Baroque architecture specialists who never learned how to share as children). The problem, of course, in not treating Baroque architecture in a course on the Roman Renaissance is that so many of Rome's Renaissance architectural projects were not completed until the Baroque period started with St. Peter's being one of the prima examples; Maderno's facade is Baroque as is Bernini's great piazza in front of the Church. For more on the Gesu, see http://en.wikipedia.org/wiki/Church_of_the_Gesu and http://www.absoluteastronomy.com/topics/Church_of_the_Gesu. For more on examples of Baroque architecture in Rome, see https://en.wikipedia.org/wiki/Architecture_of_Rome#Baroque (and follow links in text). For more on the Baroque in general, see http://en.wikipedia.org/wiki/Baroque, and http://www.visual-arts-cork.com/history-of-art/baroque-architecture.htm. 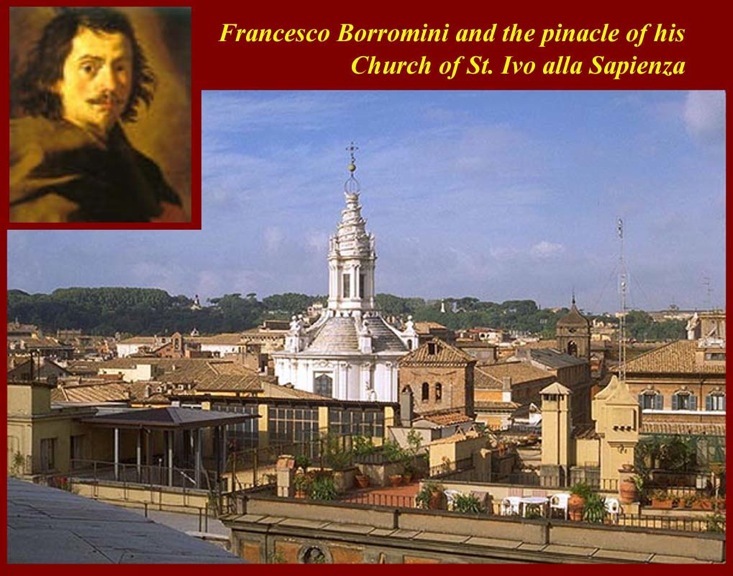 After Vignola and Laporta, the next important exponents of Baroque architecture were the rivals, Gian Lorenzo Bernini and Francesco Borromini. 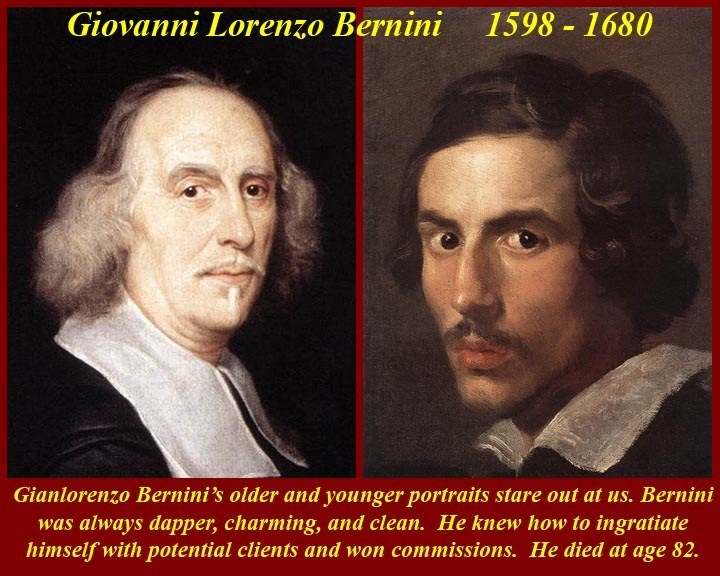 Bernini always had the advantage in their conflicting quests for great architectural commissions; he was dapper, suave, ingratiating, and clean. Borromini was the opposite. Although he is justly most famous as a sculptor, Bernini had numerous architectural commissions in his long life of 82 years. Among them was the architectural gem, Sant'Andrea al Quirinale, across the street from the Palazzo Quirinale, now the residence of the Italian President (the Papal residence until 1870, when, in the days after the Bersaglieri mountain troops of the Italian states blasted their way into Rome, Pius IX legged it for the Vatican). 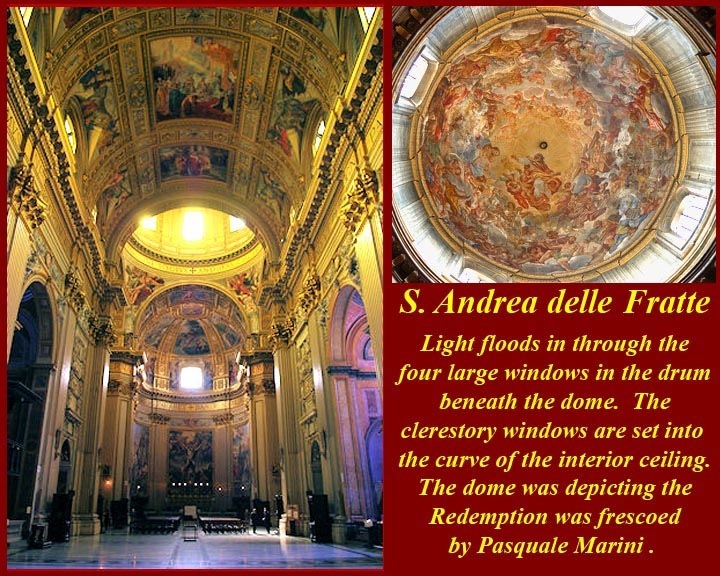 For more information on S. Andrea al Quirinale, see http://www.bluffton.edu/~sullivanm/andrea/andrea.html and http://en.wikipedia.org/wiki/Sant'Andrea_al_Quirinale. 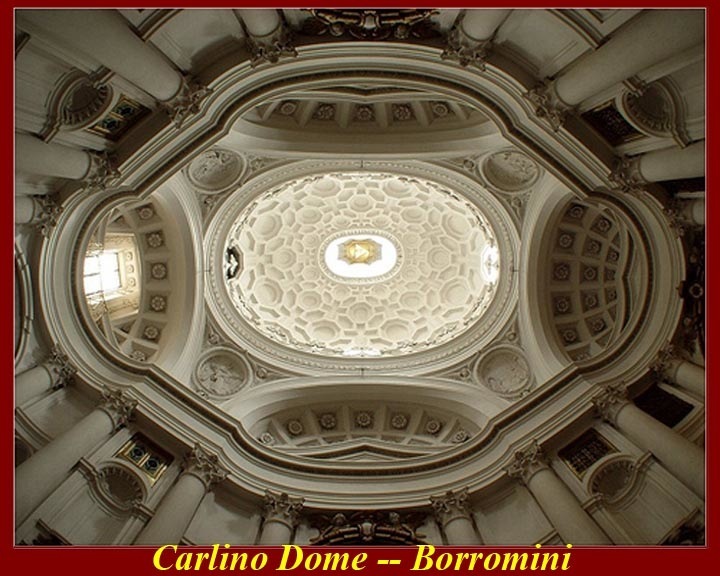 Although Borromini was less successful than Bernini at getting large architectural commissions in Rome, his work has always been considered more innovative than Bernini's, and, of course, that was also part of his problem. 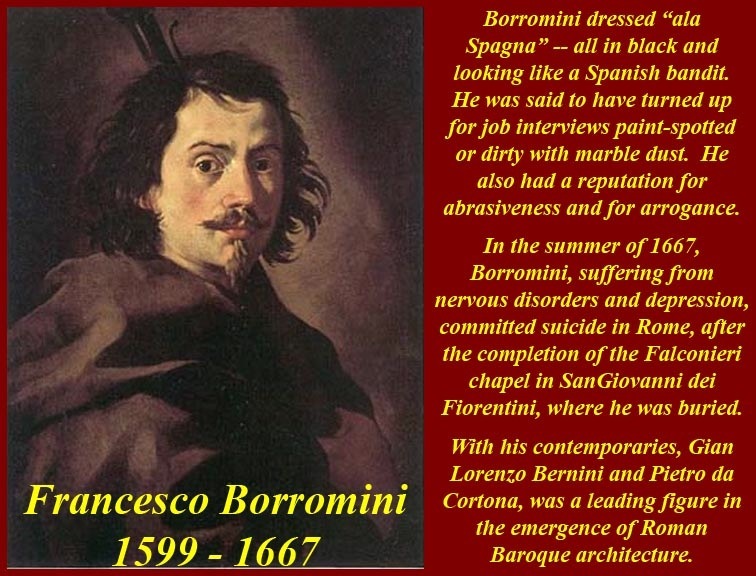 After he and Bernini parted ways (they had worked together on early commissions), Bernini apparently made it a point to advertise the oddness of some of Boromini's architecture. 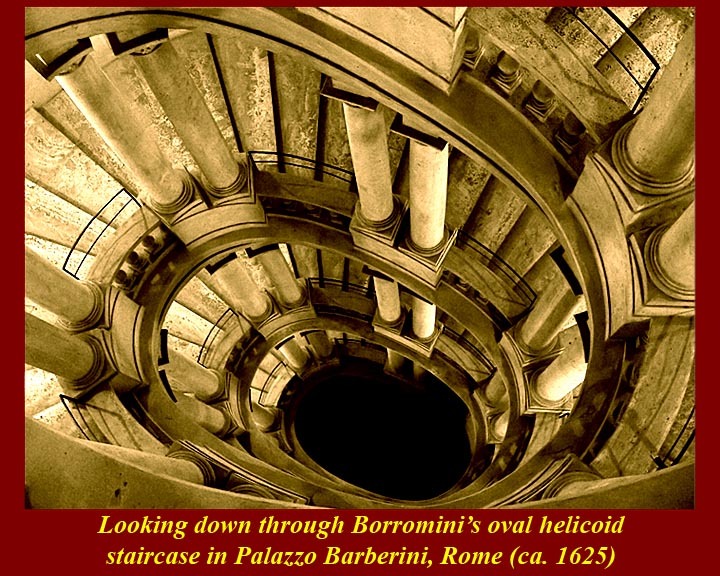 But some of Borromini's work set patterns that were followed elsewhere in Rome, in Italy, and further afield -- like the helicoid spiral staircase he designed early in his career in the Palazzo Barberini. Barberini's staircase in the other wing of the Palazzo is just single straight flights of stairs around an air shaft. Barberini's air shaft now houses the elevators of the Barberini Museum in the Palazzo, while the Borromini helix is preserved in pristine condition as one of the main attractions of the Palazzo. 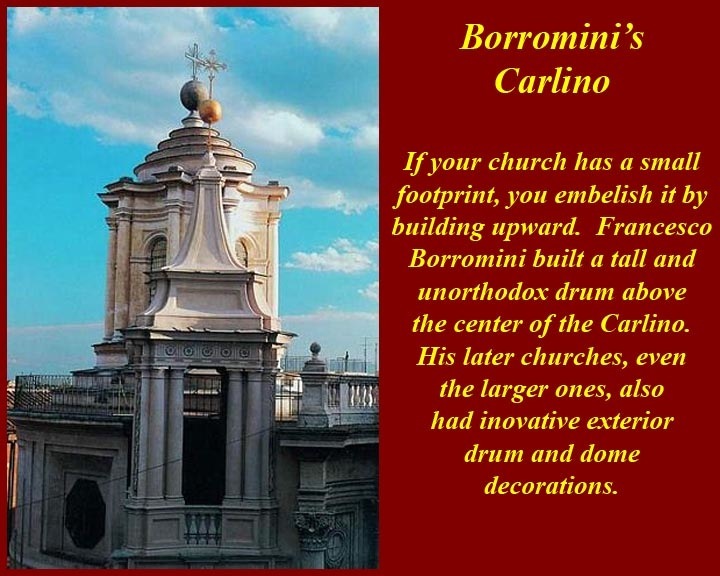 For more information on Borromini, see http://en.wikipedia.org/wiki/Francesco_Borromini and, for the competition between Borromini and Bernini, see http://roma.andreapollett.com/S2/roma-c5.htm. For the Barberini Palace, see http://romeartlover.tripod.com/Vasi36.html. 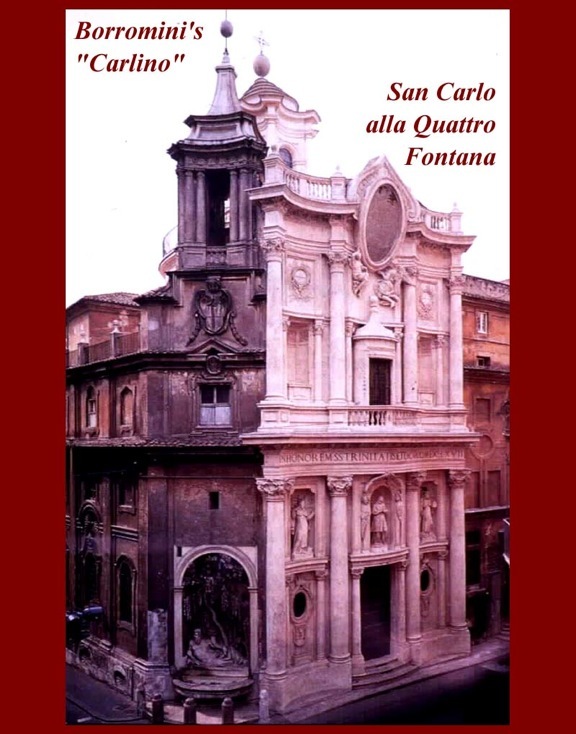 Francesco Borromini's first independent architectural work was the Church of San Carlo (Boromeo) alle Quattro Fontane, so named because it occupied one corner of an intersection that had a fountain built into each of the buildings on the intersection's corners. It is also known as the "Carlino" because of its diminutive size. 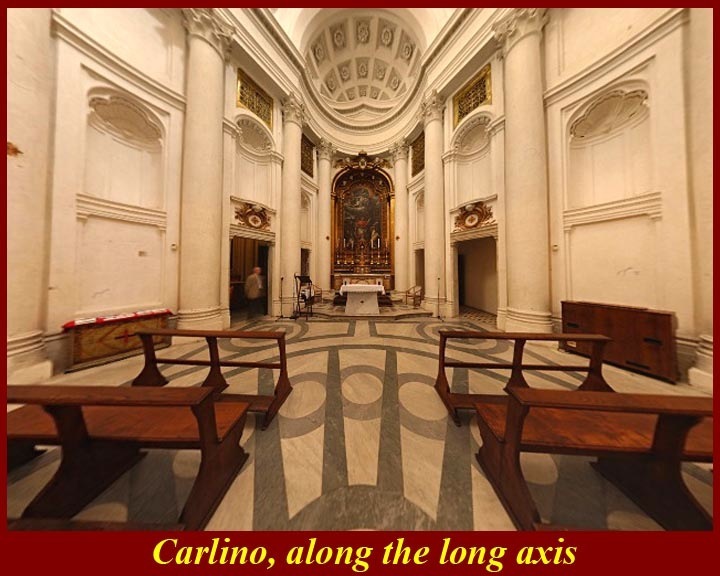 Borromini's commission for the Carlino came on the recommendation of Barberini, who had recently taken over the project at St. Peter's Basilica. 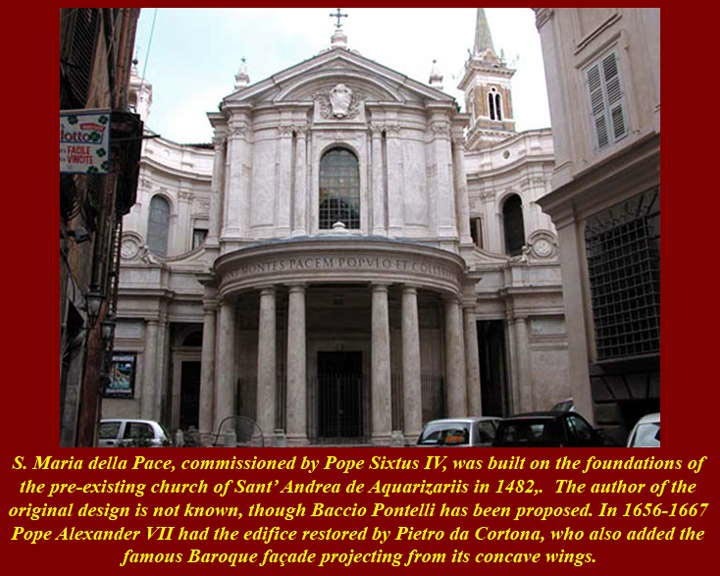 Some said that Barberini had sought the commission for Borromini to get Borromini off the St. Peter's work site where he had become a nuisance. 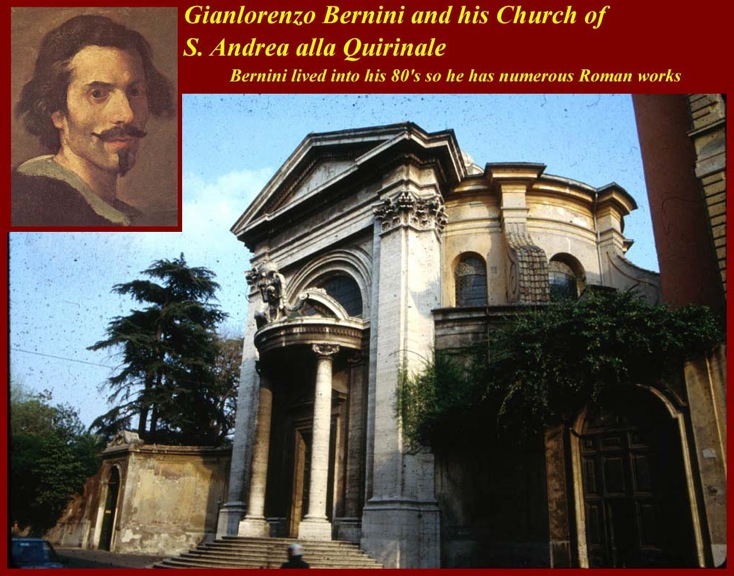 Borromini had worked as a stonemasory foreman for his distant relative, Carlo Maderno, at St. Peter's, and, when Maderno died in 1629, Borromini joined the group under Gian Lorenzo Bernini completing the St Peter's facade. But, the gossips said, Borromini really thought that he, rather than Bernini, should have been been the successor of his "godfather", Maderno. At any rate, it was said that in 1634 Borromini immediately became engrossed in his new project and turned it into a little gem; the Carlino could easily fit inside the footprint of any of the four massive piers that support the dome of St. Peter's. 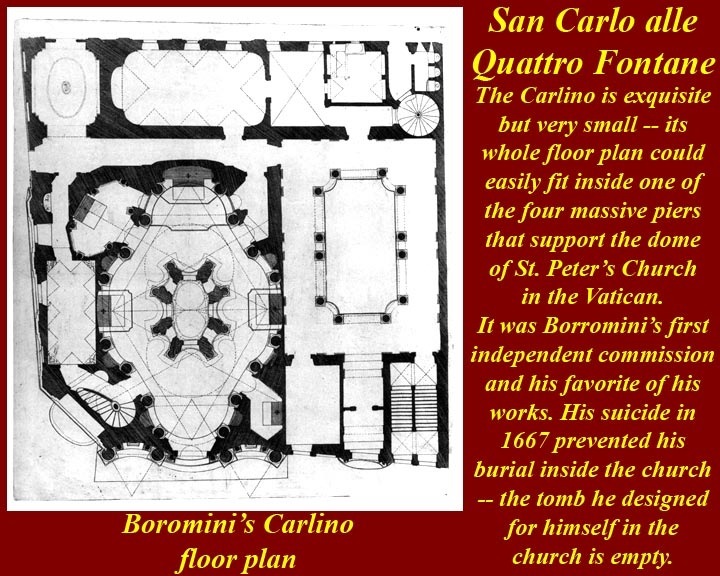 It's almost as if Borromini squeezed in the sides of the Carlino to allow himself to design both a church and a cloister on the small property of the Spanish Trinitarians, an order dedicated to freeing Christian slaves. 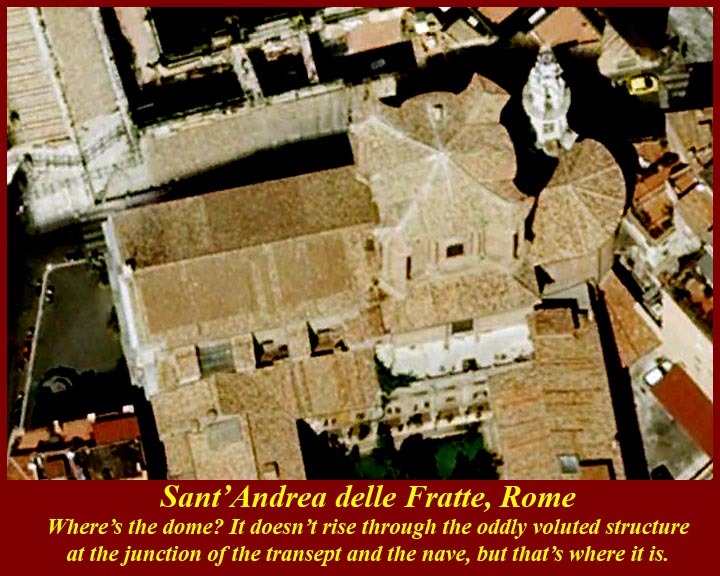 Borromini's Sant'Anfrea delle Fratte looks like a normal enough Baroque church from the front, but an oblique view allows us to see that there is some innovative -- some have said strange -- architecture in its roof. The inside appears to be almost standard -- a long high nave, a drum supporting a dome over the intersection of the nave and the transept arms, clerestory windows set into the curvature of the vault over the nave. From behind the church you can see the huge brick drum, but no dome protrudes above it -- it's all inside as is clear from the overhead view. The stone campanile, said to have been designed and carved by Borromini, is also said to have been lifted to its tall brick base in one piece. 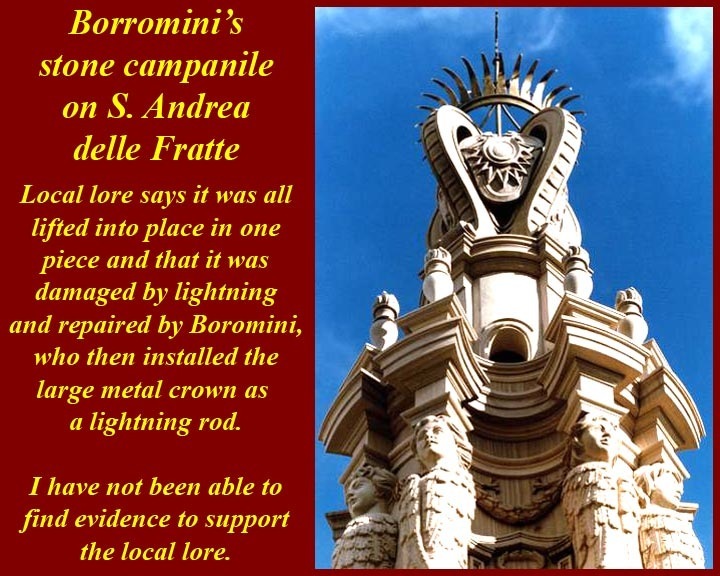 And local lore says it was almost immediately struck by lightning and that Borromini repaired it and emplaced the huge coronal lightning rod on top. There's no telling whether what is said is actually true. It does appear that the huge buttresses were a later addition; from inside the attic above the interior vault, it's possible to see traces of earlier windows where each buttress now is. 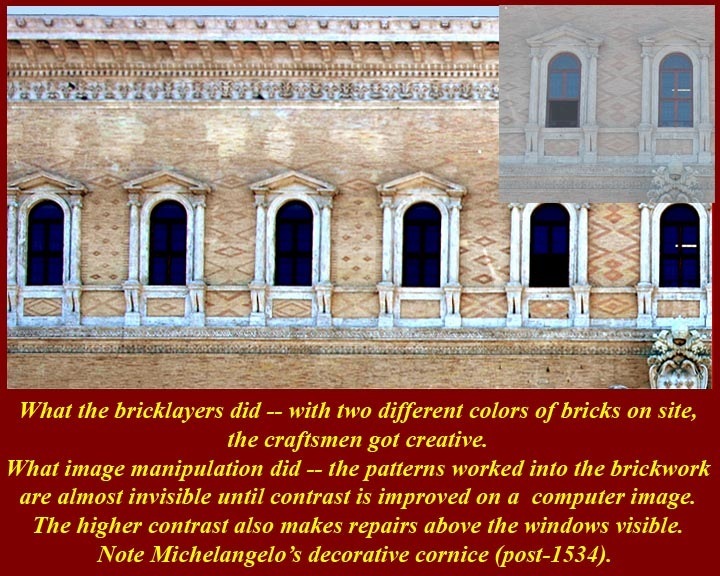 Borromini wanted to stucco the whole exterior of the brick structure, but no trace of plasterwork has ever been found. 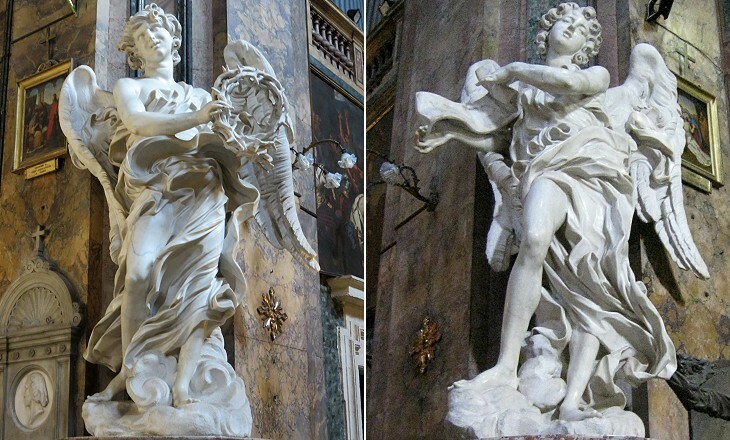 Two marble angels made by Gian Lorenzo Bernini for the Ponte Sant'Angelo are kept here, near the high altar. They are the only angels for that project that were made by him; the ones on the bridge were made by his pupils. As do the angels on the bridge, Bernini's angels hold two symbols of Christ's Passion, the scroll and the Crown of Thorns. As might be expected, Bernini's angels are the tourist draw for this church rather than Borromini's Architecture. 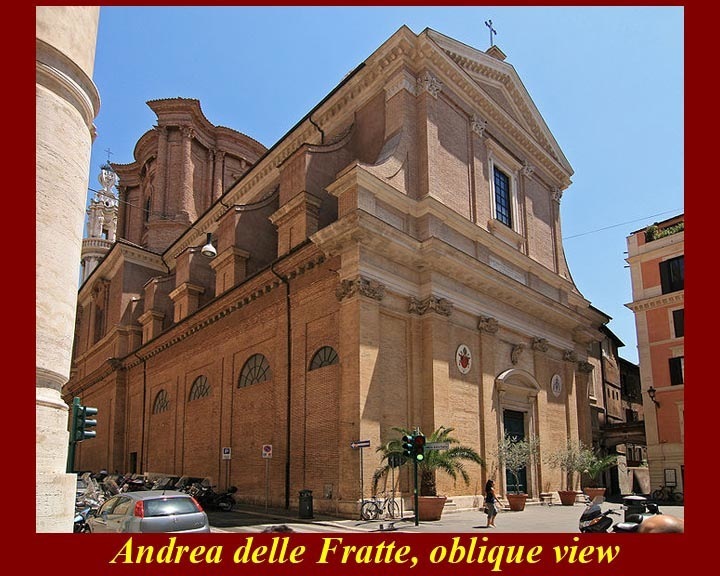 For more on this church, see http://romanchurches.wikia.com/wiki/Sant'Andrea_delle_Fratte. You can see Bernini's angels (and other Roman Baroque angels) at http://www.romeartlover.it/Angels.html. 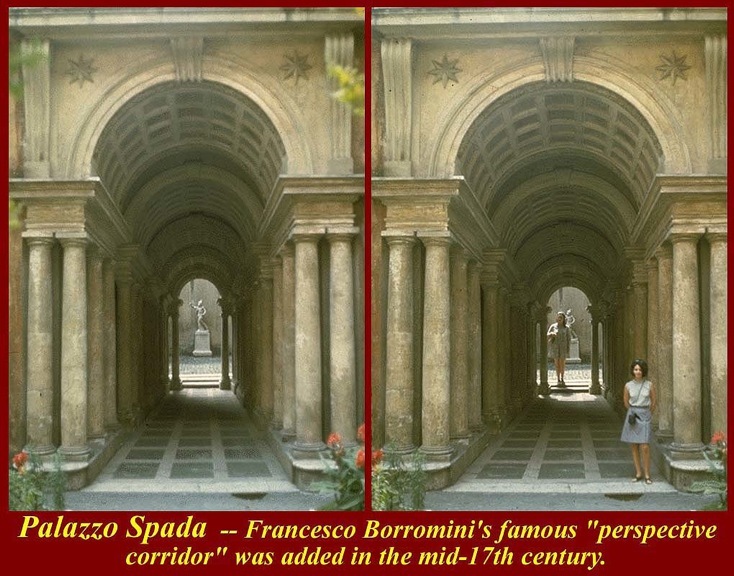 At Rome's La Sapienza University, officially Sapienza - Università di Roma (founded 1303), Borromini was again forced to design a church that would fit into a pre-defined space in a pre-existing palazzo. 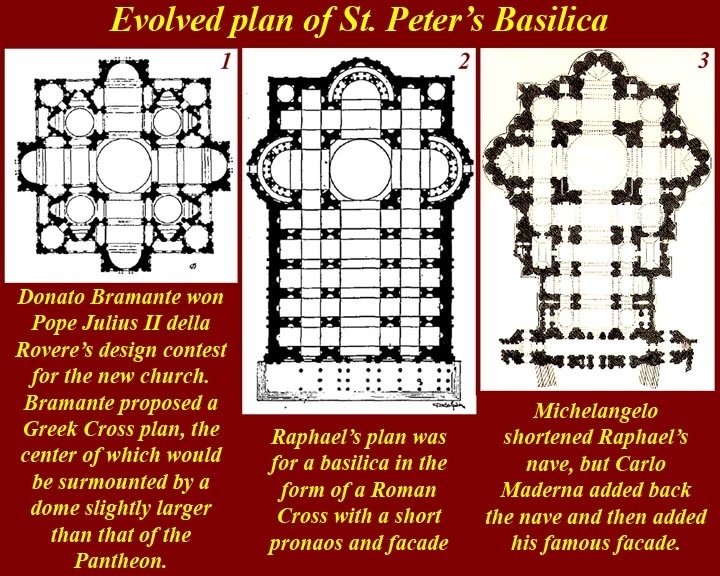 He choose a plan resembling a star of David, and merged the facade of the church with the courtyard of the palace. The dome, with its corkscrew lantern, is remarkable in its novelty. The complex rhythms of the interior have a dazzling geometry to them. 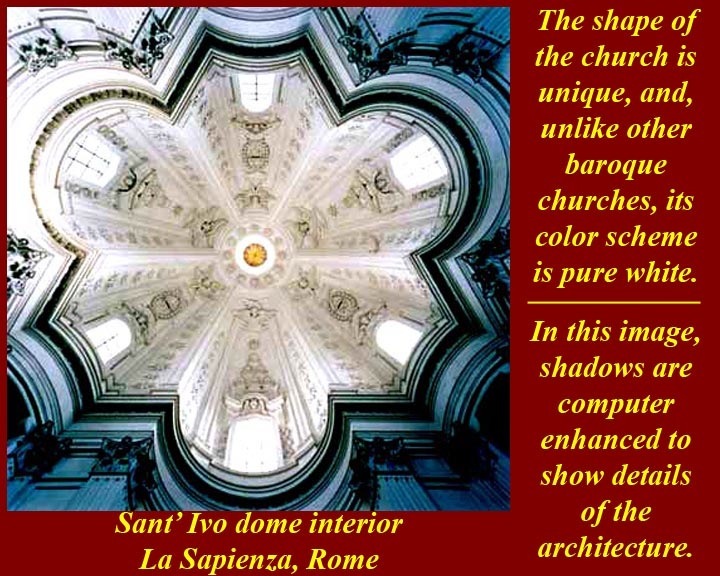 It is a rational architecture- intricate to view, but on paper the overlap of a circle on two superimposed equilateral triangles creates a basis for a hexagonal array of chapels and altar in a centralized church. The undulations, both concave and convex of the interiors, create a jarring yet stunning appeal. The decoration is a mixture of novel organic (six-winged cherubic heads) and geometric (stars), more platonic than the contemporary gilded and plaster excesses of Bernini. Rising along the base of three of the dome's pillars are the symbol of the papal Chigi family, the "six mountain beneath a star". The main artwork of the interior is the altarpiece by Pietro da Cortona, portraying St. Yves. 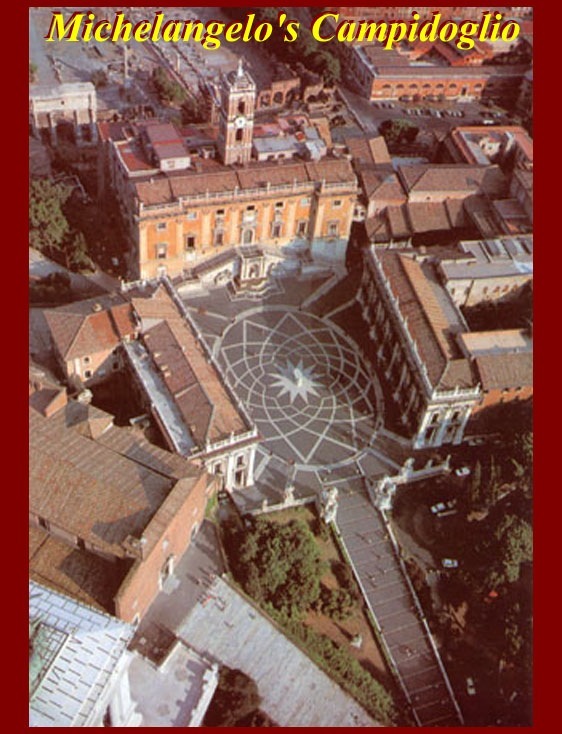 For more information including Borromini's interlocking geometric plans for Sant'Ivo, see http://www.greatbuildings.com/buildings/S._Ivo_della_Sapienza.html. 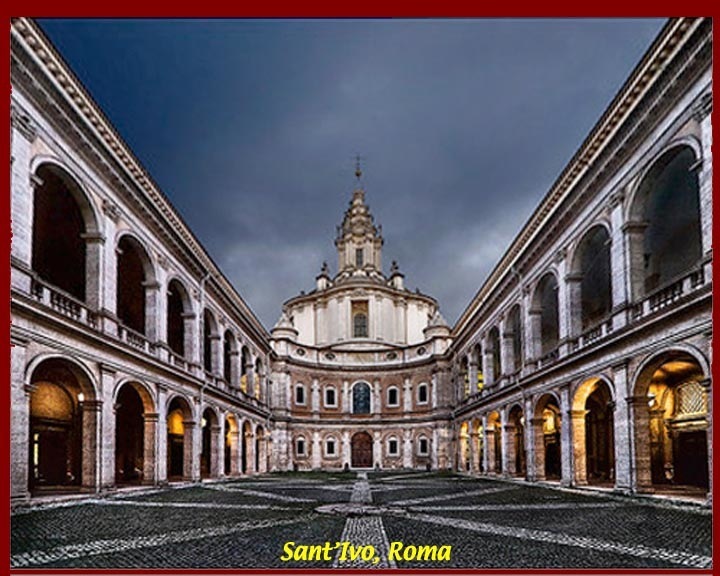 For more information on La Sapienza University see http://en.wikipedia.org/wiki/Sapienza_University_of_Rome. For the world's oldest universities see http://en.wikipedia.org/wiki/List_of_oldest_universities_in_continuous_operation. The Farnese family was an influential family in Renaissance Italy. Its most important members included Pope Paul III (Alessandro Farnese) and his grandson, Cardinal Alessandro Farnese, and the titles of Duke of Parma and Piacenza and of Castro were held by various members of the family. There is much confusion about the Farnese, because for several generations many of the important men were named Alessandro. Farnese women later married into the Bourbon line that ruled Naples and then into Napoleon's family thereby giving a slight semblance of legitimacy to Joseph, Napoleon's brother, during his two year reign as King of Naples. A number of important architectural works and antiquities are associated with the Farnese family, either through construction or acquisition. Some of the Roman/Italian antiquities retained by the Louvre in Paris were "inherited" from the Neapolitan Farnese -- but were seized by Napoleon. 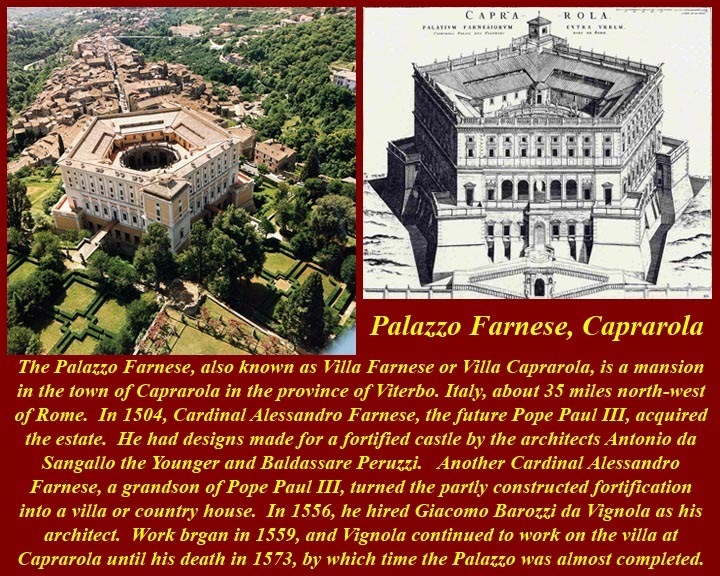 Buildings include the Palazzo Farnese in Rome and the Villa Farnese at Caprarola. Palazzo Farnese was designed by Antonio da Sangallo the Younger (1484-1546), one of Bramante's assistants in the design of St. Peter's. Construction began in 1515 after one or two years of preparation, commissioned by Alessandro Farnese, who had been appointed as a Cardinal in 1493 at age 25 (thanks to his sister, who was Pope Alexander VI Borgia's official mistress) and was living a princely lifestyle. Work was interrupted by the Sack of Rome in 1527. 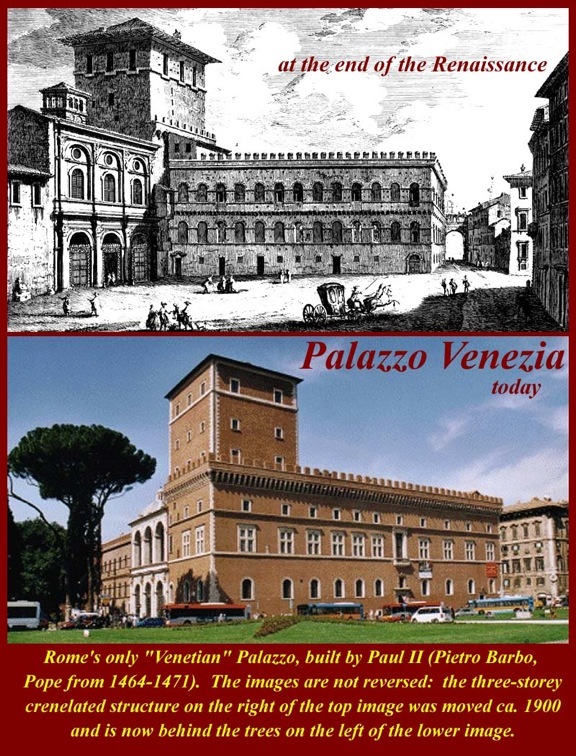 In January 1534, Cardinal Alessandro became Pope Paul III, and the size of the palace was increased significantly. He employed Michelangelo who completed the redesigned third story with its deep cornice and revised the courtyard as well. The post-1534 developments were not only a reflection of Alessandro's change in status but employed architecture to express the power of the Farnese family, much as at their Villa Farnese at Caprarola. Notable features of the Palazzo Farnese's facade, facing Piazza Farnese, are the alternating rounded and peaked pediments above the windows of the piano nobile, (the second level, which held the ceremonial rooms and important apartments), the rusticated central portal, and Michelangelo's projecting cornice. Michelangelo revised the central window of the piano nobile after Paul III became pope, adding an architrave to support the largest coat-of-arms with papal tiara that Rome had ever seen. When Paul stepped to the balcony, the entire facade became a setting for his person. The two fountains in the Piazza are granite tubs that the Farnese brought from the Baths of Caracalla in the 16th century. 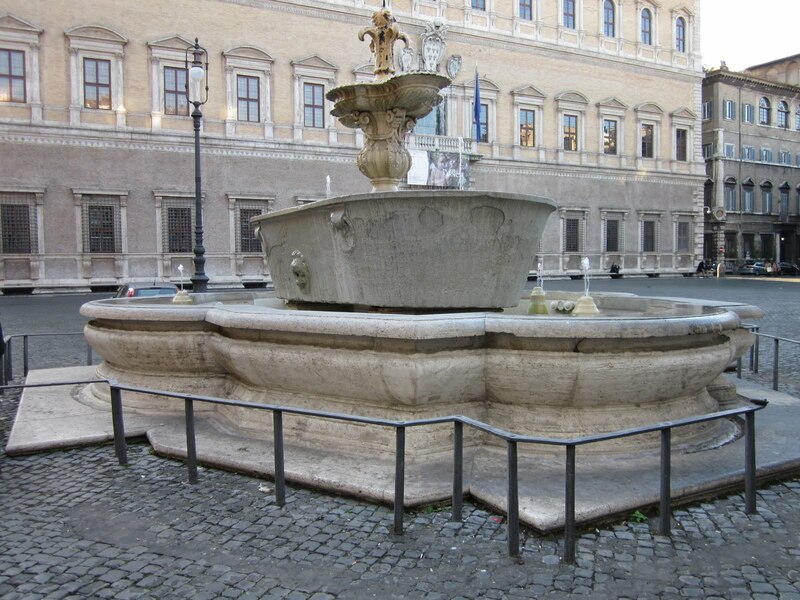 They commissioned the architect Girolamo Rainaldi to fashion them into two fountains. 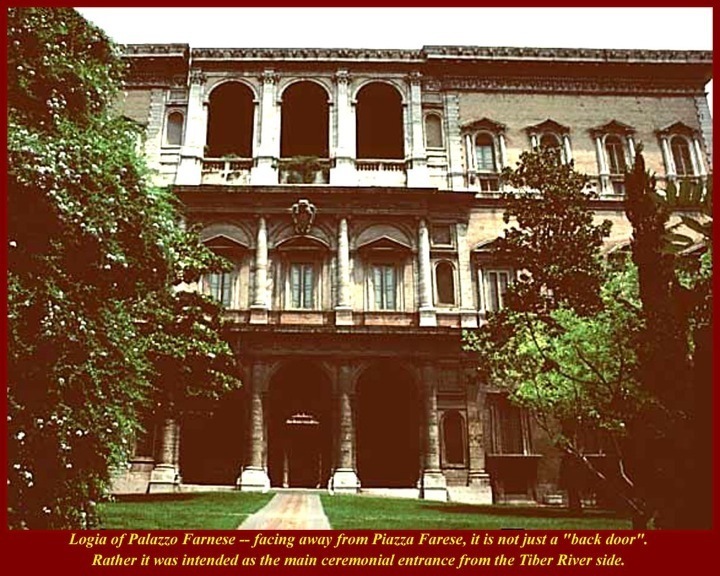 The Palazzo's "back porch", an imposing three level loggia, was actually its ceremonial entrance for guests arriving via the Tiber. 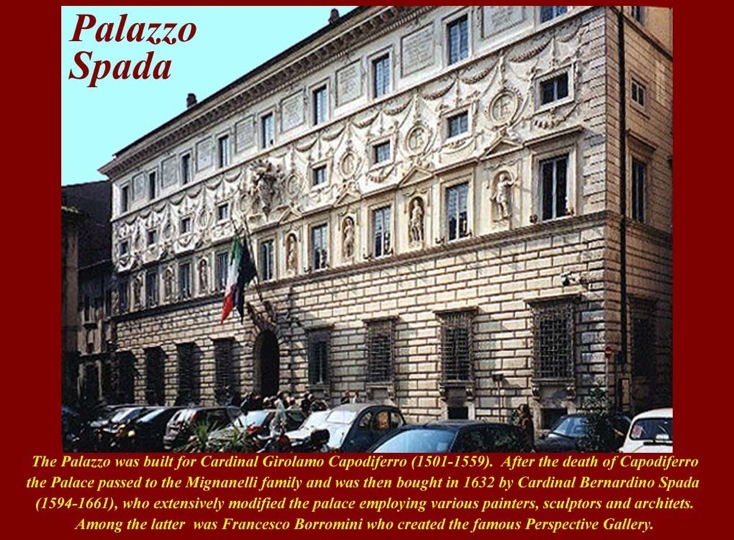 The Cardinal would normally stand in the middle of the second level (which was not closed off by windows during the Renaissance), on the level of the piano nobile, and greet visitors from above. Only for the most important visitors would he descend to ground level. Coming off the western corner of the Palazzo is Michelangelo's bridge which spans the Via Giulia and connect the palace to an outbuilding closer to the Tiber. During his papacy, Paul III would cross the bridge to his private retreat. 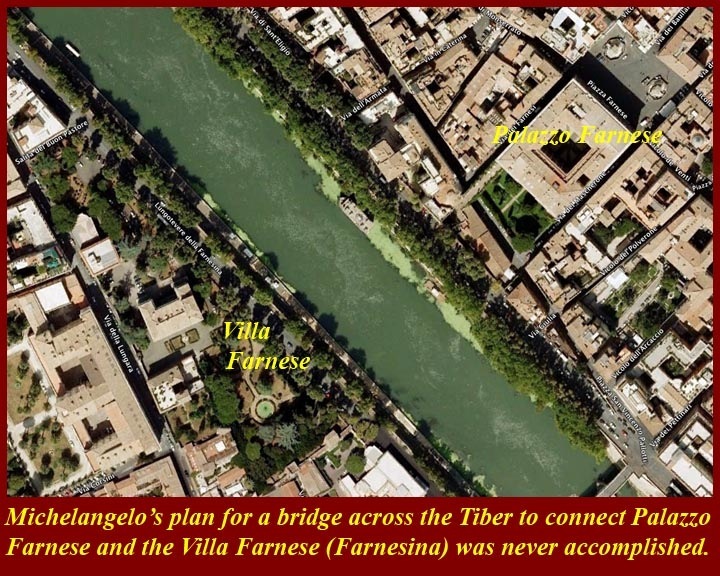 Michelangelo had planned that the bridge would extend all the way across the Tiber to the Farnese Villa on the western bank (the "Farnesina"), but that project was never carried out. In Puccini's opera Tosca, (1900), set in Napoleonic Rome, the heroine's confrontation with the malevolent Chief of Police, Scarpia, takes place in Palazzo Farnese. One filmed version of Tosca, available on DVD, was actually made in the three locations in which th opera was set: Act 1 is filmed in the Roman church of Sant'Andrea della Valle, Act 2 in Palazzo Farnese, and Act 3 is on the roof of Castel Sant'Angelo. 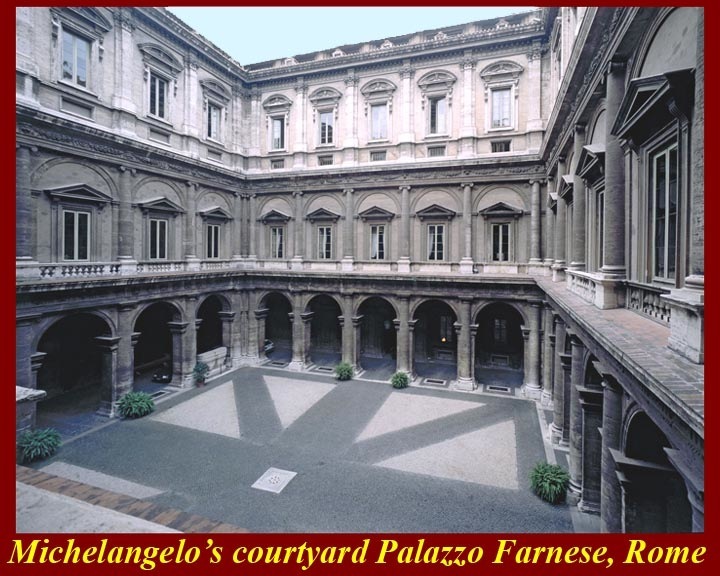 The Palazzo was inherited from the Farnese by the Bourbon kings of Naples, from whom the French government purchased it in 1874. 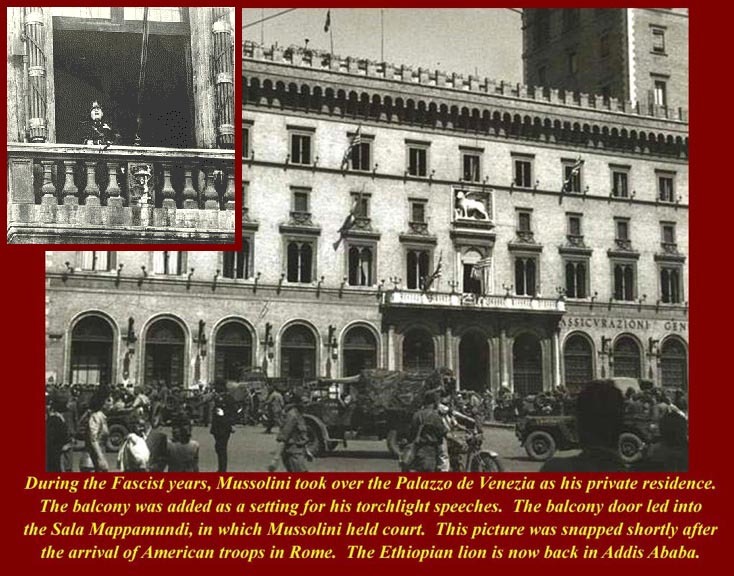 Though the government of Mussolini ransomed it in 1936, the French Embassy remains, under a 99-year lease. 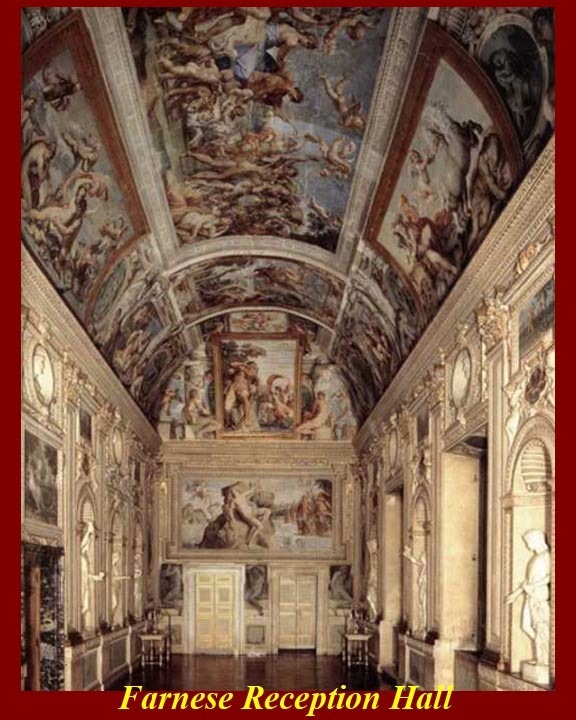 For the Villa Farnese, see http://en.wikipedia.org/wiki/Palazzo_Farnese,_Rome and http://www.romeartlover.it/Vasi73.htm. For Villa Farnese at Caprarola, see http://en.wikipedia.org/wiki/Villa_Farnese. For Paul III, see http://en.wikipedia.org/wiki/Pope_Paul_III and http://www.newadvent.org/cathen/11579a.htm. The Ponte Sisto is a bridge built by architect Bartolomeo ("Baccio") Pontelli of scavenged travertine from the Colosseum. Opened in 1475, its main purpose was to shorten the commute of Sixtus IV della Rovere. Remains of a 1st century AD bridge built by Marcus Agrippa for Augustus are incorporated -- the darker stones under the arches in the image. It is now a pedestrian bridge. See http://en.wikipedia.org/wiki/Ponte_Sisto. 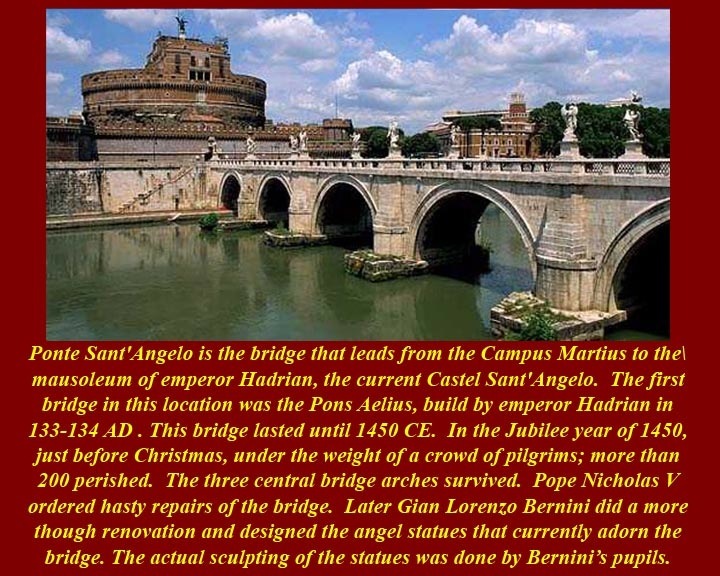 For images of all of Rome's bridges, see http://catholic-resources.org/AncientRome/Tiber.htm. 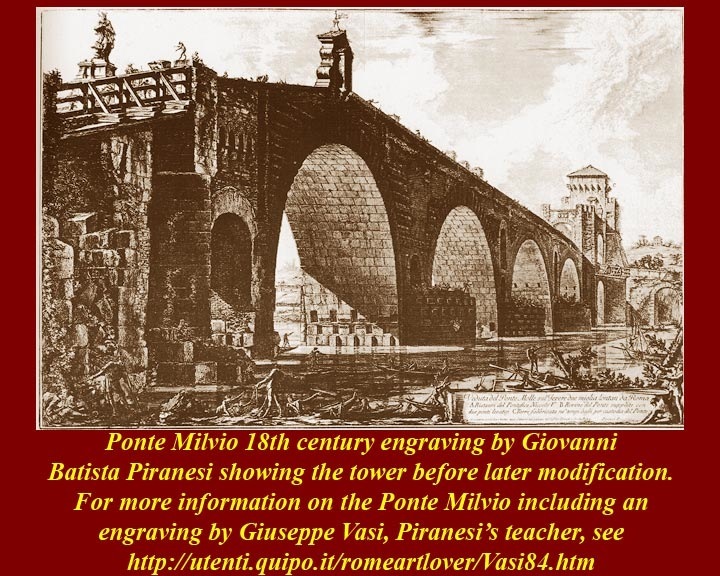 Famous battles, conspiracies, monks, popes all provided the history of the Ponte Milvio. 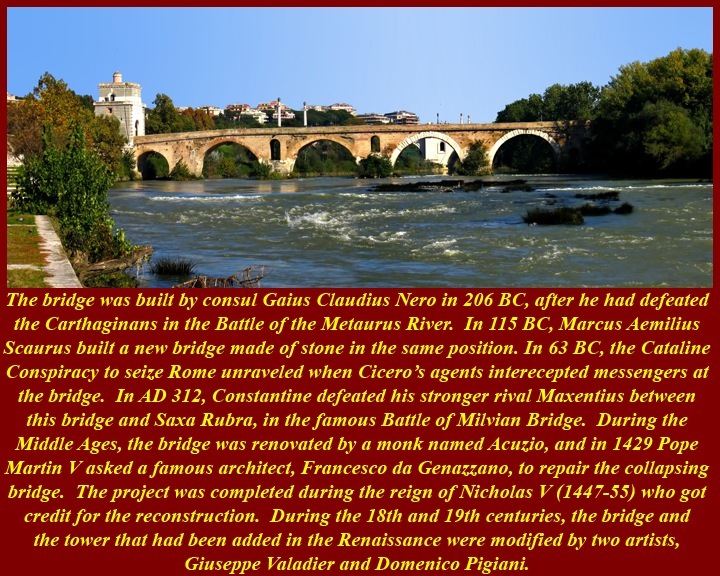 The Bridge was rebuilt by Francesco da Ganazzano on a 1429 commission from Pope Martin V, but the job was not completed until the reign of Nicholas V (1447-55) so Nicholas was credited with the project, which included the large defensive tower on the Trastevere end of the bridge. It is now open for pedestrian traffic only. 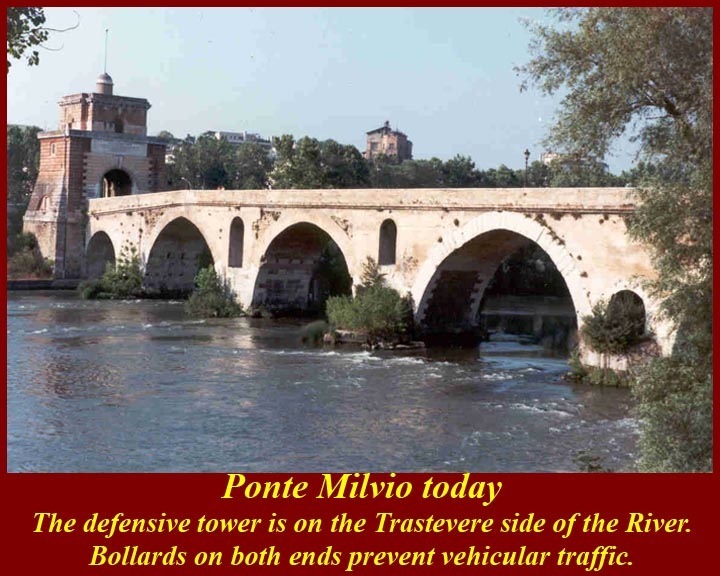 See http://en.wikipedia.org/wiki/Ponte_Milvio and http://en.wikipedia.org/wiki/Battle_of_the_Milvian_Bridge and http://www.romeartlover.it/Vasi84.htm. In 1450 Pope Nicholas promoted the first great Jubilee Year after the end of the Great Western Schism, and crowds of pilgrims responded. An almost inevitable result was an outbreak of plague in overcrowded Rome. and that was followed by the deaths of almost 200 pilgrims either in a collapse or a crush of the crowd on the ancient Roman Pons Aelius. The Pons Aelius had originally been built across the Tiber for Hadrian (whose family name was attached to the bridge) in 133-34 AD to give access to his mausoleum on the Trans Tiber (Trastevere) side of the River. 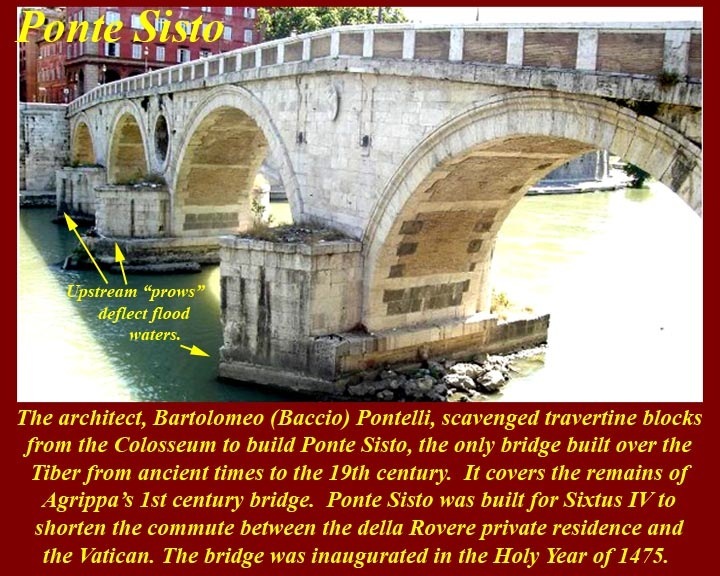 Whether the bridge actually collapsed or not, orders were immediately given to widen and rebuild the bridge to provide access to St. Peter's and the Vatican from the eastern side where the other pilgrimage churches were located. Later, the Bridge was decorated with angels sculpted by Gian Lorenzo Bernini and his students. Only two were actually done by Bernini himself, and they were ultimately moved to the inside of the church of Sant'Andrea delle Fratte. Replicas were placed on the bridge to replace Bernini's angels. 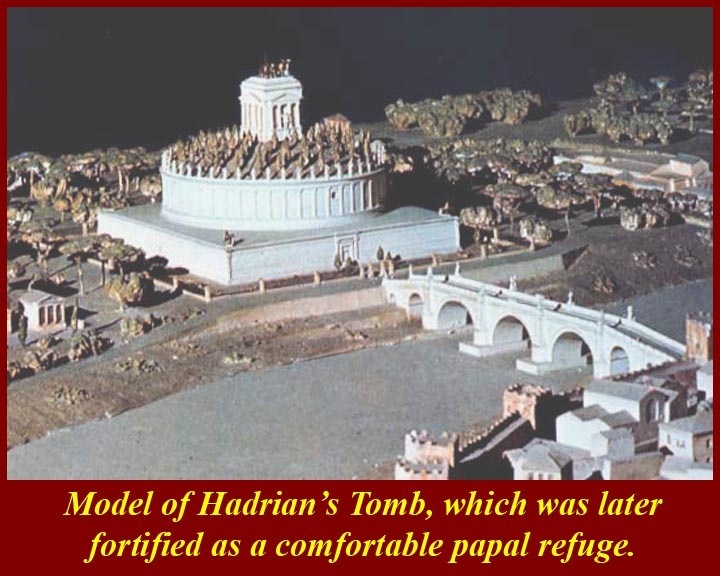 Starting already in the the fourteenth century the popes had begun to rebuild Hadrian's tomb as a fortified retreat. 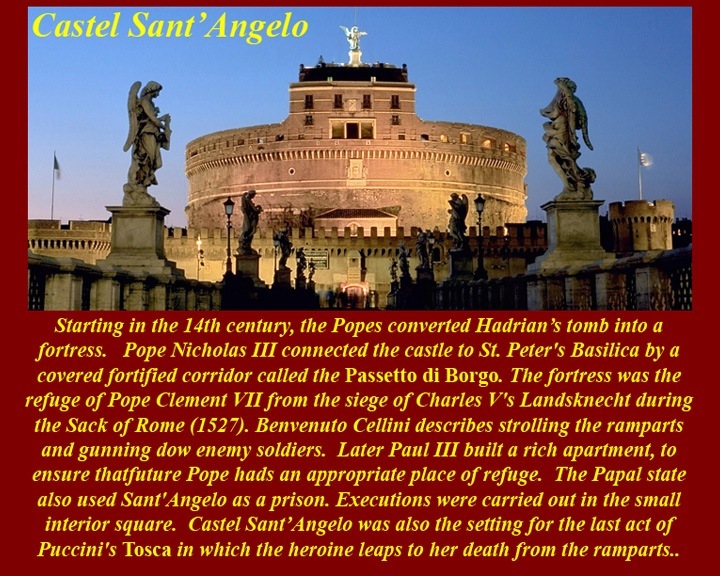 It was called Castel Sant'Angelo because of the supposed appearance of the Archangel Michael appeared atop the mausoleum, sheathing his sword as a sign of the end of the plague of 590. 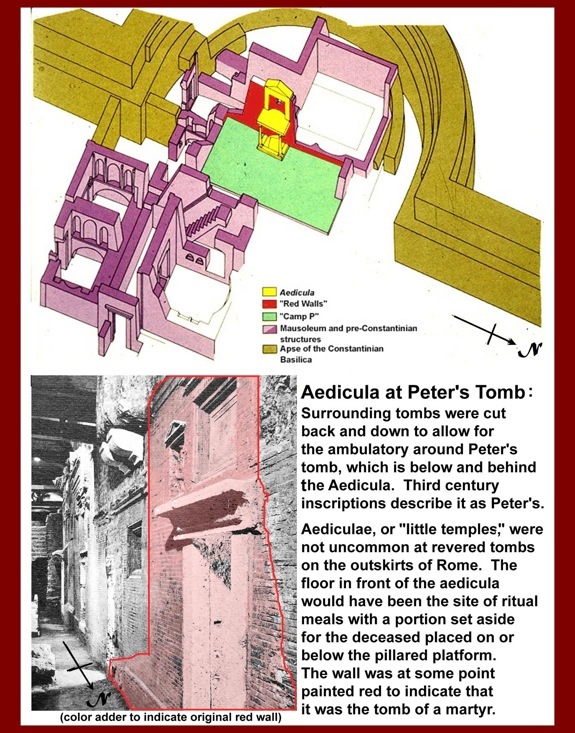 Much of the tomb contents and decoration has been lost since the building's conversion into a military fortress in 401 and inclusion by Flavius Augustus Honorius in the Aurelian Walls. The urns and ashes were scattered by Visigothic looters in Alaric's sack of Rome in 410, and the original decorative bronze and stone statuary was thrown down upon the attacking Goths when they besieged Rome in 537. 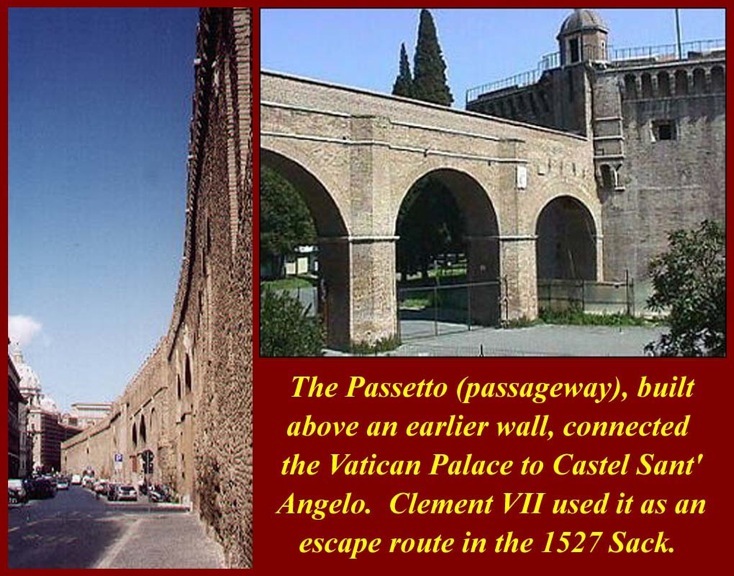 Pope Nicholas III, in 1277 connected the fortress to the papal palace by building the passetto, and his foresight enabled pope Clement VII to escape the Kandsknechts of Charles V during the 1527 Sack of Rome. Throughout the Renaissance, improvements were made to the papal refuge to increase the comfort of potential papal refugees and to provide less comfortable quarters for papal prisoners. The Castel Sant'Angelo is now a museum and a convenient place for taking pictures of Rome. For a history of the Jubilees, see http://www.newadvent.org/cathen/08531c.htm. 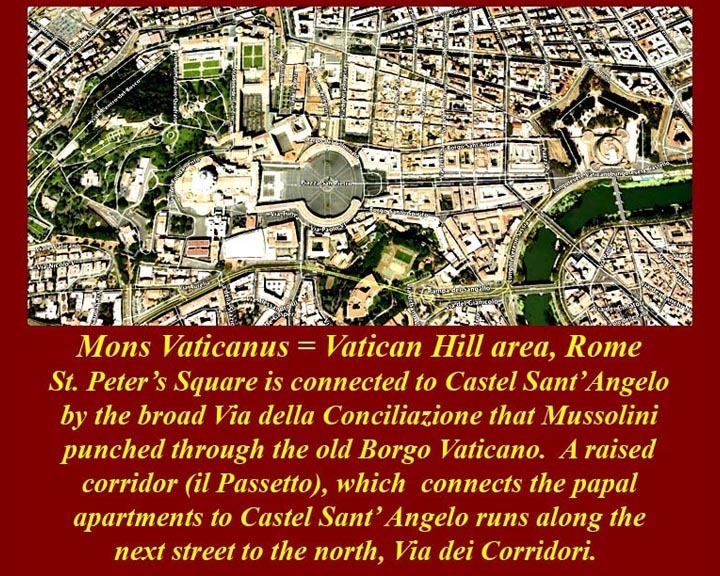 For more information on the passetto, see http://saintpetersbasilica.org/Exterior/Passetto/Passetto.htm and for the Sack of Rome, see http://www.mmdtkw.org/VSackRome.html and http://www.mmdtkw.org/RenRom0800-Sack1527Intro.html. Unit 8 of this course will be devoted to the sack and its aftermath -- see http://www.mmdtkw.org/RenRomUnit0800-0PixList.html. 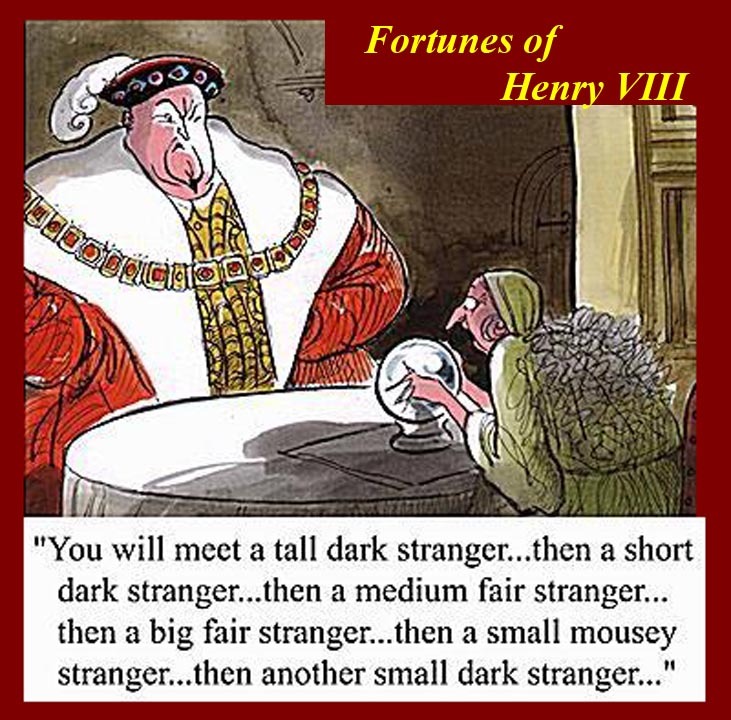 Bad timing, Henry VIII. When William Knight, the King's secretary and the emissary of Henry VIII, arrived in Rome to seek the annulment of Henry's marriage to Catherine of Aragon, he found Clement VII holed up in Castel Sant'Angelo where he had taken refuge from the rebellious army of Landsknechts of Charles V. After Rome fell, Clement was, in fact, a prisoner in the Castel Sant'Angelo. Clement had every reason to fear Charles and did not want to do anything to make his situation even more fearsome. (Catherine was an aunt of Charles, so Henry's divorce of Catherine would not be popular in the court of Charles). Under the circumstances it was difficult for Knight even to gain access to Clement, and, in the end, he had to return to England with a conditional dispensation. Cardinal Wolsey ruled that a conditional dispensation was technically insufficient. A few months earlier (i.e., before Clement was immured), things might have gone differently.